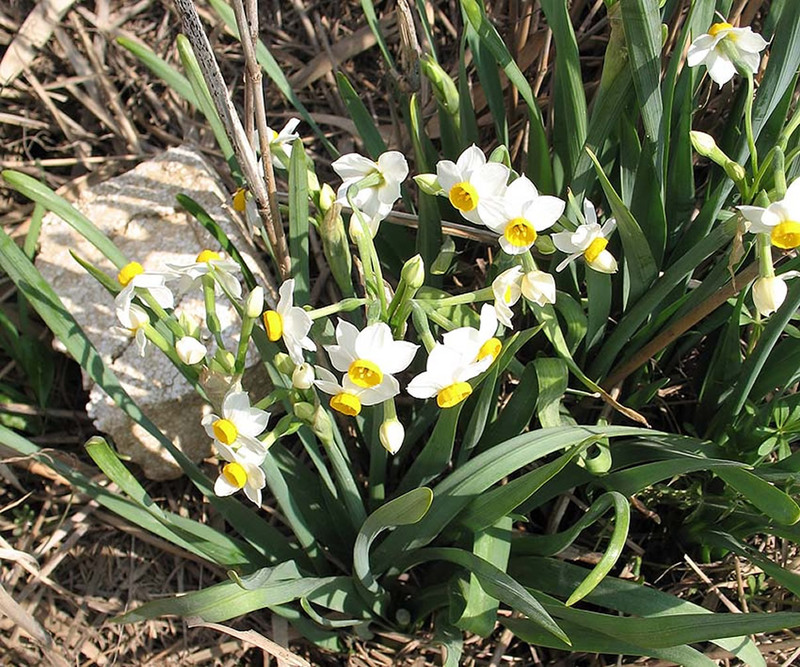 Distribution and habitat: Narcissus tazetta is a widespread species, native to the Mediterranean region from Portugal to Turkey and across the Middle East and Central Asia to Bhutan, as well as from the Canary Islands, China and Japan. It is also naturalized in Australia, Bhutan, Korea, Norfolk Island, New Zealand, Bermuda, Mexico and the United States. In wild Narcissus tazetta natural habitat are garigue (especially if with considerable amount of soil) uncultivated fields and valleys. 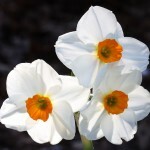 Description: Narcissus tazetta are bulbous perenial plants grown for their fresh coloured graceful scented flowers. 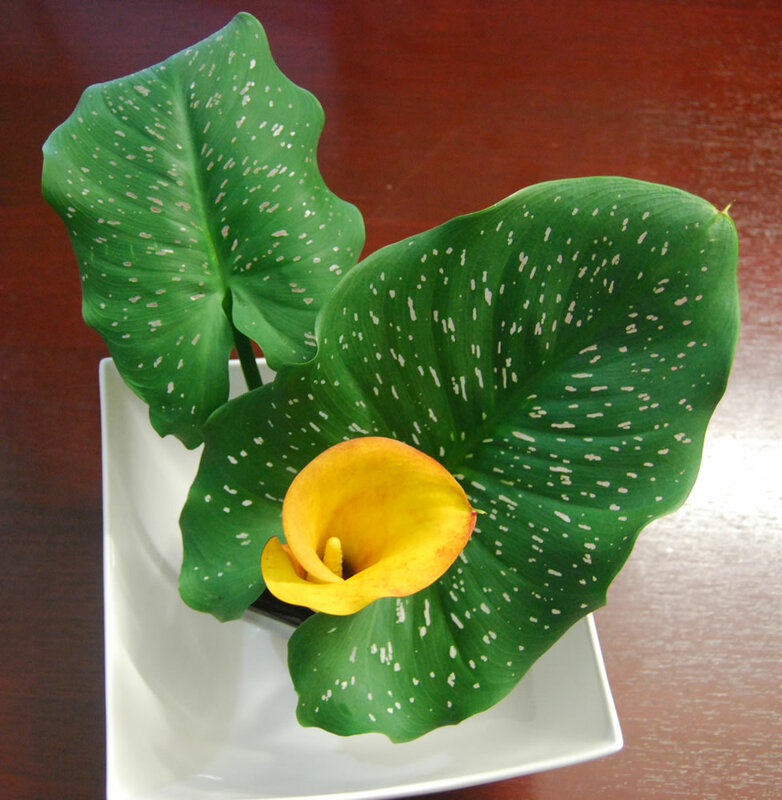 This plant has thin, flat leaves up to 40cm (16 inch) long and 15mm (0.6 inch) wide. Narcissus tazetta are bunch flowered (polyanthus) types of Narcissus and are most suitable species of this genus for use as indoor plants. Umbels have as many as 8 flowers, white with a yellow corona. The flowers have a cup (trumpet) shaped corona that are sometimes very much reduced in size and are backed by 6 petals. 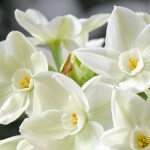 Plants care: Indoors Narcissus tazetta bulbs can be forced to flower in winter. Potted plants can be enjoyed while coming into flower and during the brief flowering period, but they must be discarded when the flowers have faded. The bulbs will not flower twice indoors. 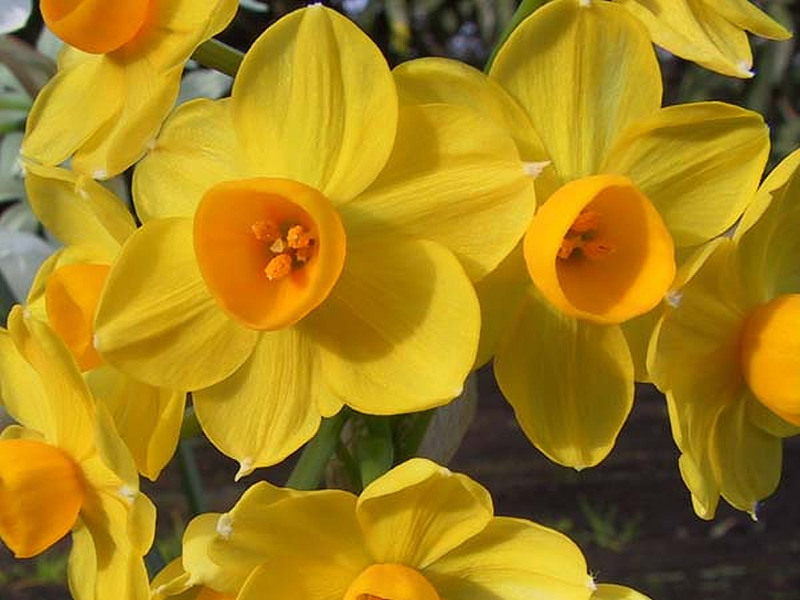 It is possible to buy Narcissus tazetta that have been subjected to a special cooling treatment that makes them flower earlier than than untreated bulbs. These treated Narcissus tazetta bulbs (always clearly labelled as such) may be started into growth either in the light or in the dark. The disadvantage of untreated bulbs is that they must be started in the dark. The best time for planting is early autumn and a cool temperature for the first few weeks is essential. Do not subject budding Narcissus tazetta to room temperatures above about 15°C (59°F). Heat will cause flower buds to shrivel. It will also shorten the life of any that do develop. Planting on pebbles: Use a water-proof container at lest 10-13cm (4-5 inch) deep and cover the bottom with pebbles. Place 5 or 6 ‘double-nosed’ bulbs (those partially divided into two flowering-size sections, but remaining attached to each other) or 8 to 10 fair-sized single buds on top of the pebbles. Stand the bulbs together, almost (but not quite) touching and put more pebbles around them as a support. Add only enough water to reach a point just below the base of the bubs. As roots are produced, they will work their way down to the water. This method is actually a form of hydroculture. Store the container in a cool place – not above 9°C (48°C) – and top it up with water from time to time. The bulbs should remain at this low temperature (and, if untreated, in the dark) until they have made about 8cm (3 inch) of growth and flower buds have appeared through the neck of the bulbs. There after, move the container gradually (over a period of about a week) into a brightly lit position. Once acclimatised the plants need as much as direct sunlight as they get. Planting in potting mixture: For growing Narcissus tazetta in potting mixture or bulb fibre use either waterproof containers (such as decorative bowls) or pots or pans with drainage holes. Plant several bulbs together, each bulb half in and half above the fibre or potting mixture which may be either soil or peat based. Make sure that the fibre or potting mixture is moist, not sodden, before planting. Store the container in the coolest possible position and in the dark (preferable even for treated bulbs). 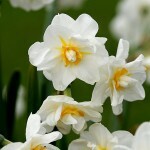 Commercial growers plunge potted Narcissus tazetta in fibre or mixture in the ground under a thick layer of peat moss. If it is impossible to provide such outdoor treatment, enclose the potted bulbs in black plastic bags and place the bags in a cool position. Examine the container once or twice during the nest few weeks. If the potting mixture appears to be drying out, add just enough water to keep it evenly moist. When the bulbs have made 8cm (3 inch) of top growth and flower buds have cleared the necks, move the container gradually (over a period of about a week) into a brightly lit position. Once acclimatised the plants need as much as direct sunlight as they get. 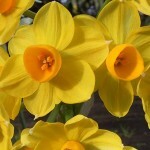 Gardening: Outdoors Narcissus tazetta plants bloom in late winter or early spring. They are not as hardy as the majority plants of this genus and will not do well in gardens with very cold winters. This species will not likely do well in colder or warmer zones than its hardiness zone. The dormant bulbs will withstand soil temperatures down to at least -5°C (23°F). Remove flower stems at the base of the plants with hand clippers after the flowers fade. This tidies up the garden and prevents the plants from using their energy to produce seeds. They will save energy in their bulbs and will help them to produce prolific blooms again the next year. Do not cut back the plants until the foliage begins to fade (about 6 weeks), typically in summer when the bulb goes dormant. Use pruning shears and snip the foliage to the ground. 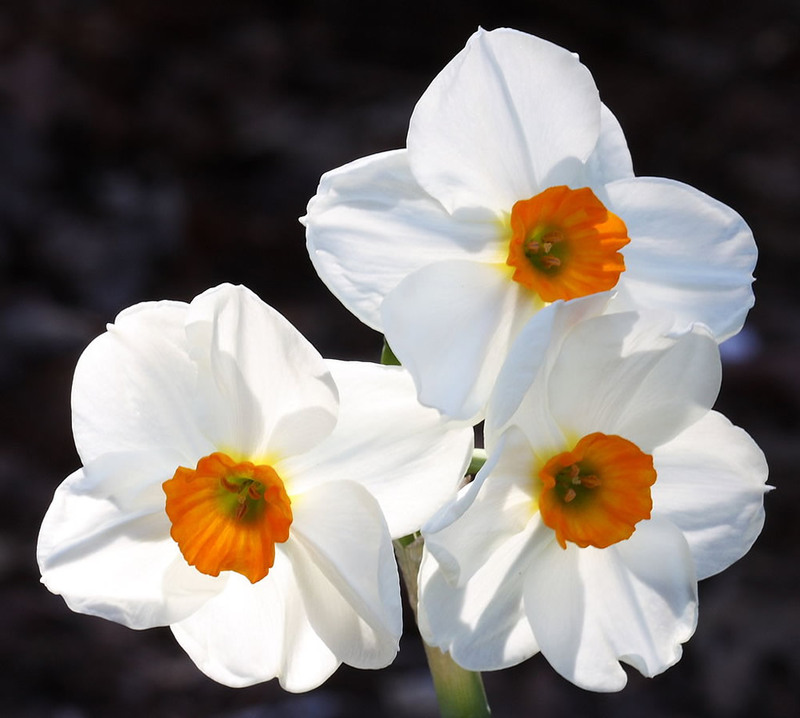 As long as a Narcissus tazetta is green, it is still photosynthesizing sunlight into energy, which is stored in the bulb for the next growing season, so do not prune early. 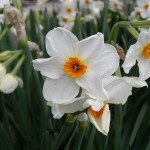 Position: Narcissus tazetta is best grown in a warm sunny corner with shelter from cold winds. 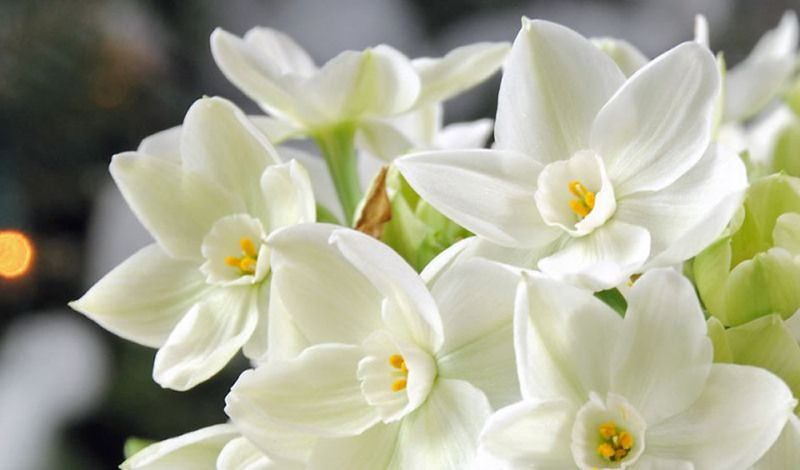 Place Narcissus tazetta bulbs in full sun so the flowers and foliage receive at east six hours of sunlight a day, preferably in the morning with afternoon shade. Soil: Narcissus tazetta plants prefer a deep rather stiff soil but succeeds in most soils and situations. They grow well in heavy clay soils, but prefer an alkaline soil with a pH between 7 and 8. These plants can live in regular well-tilled garden soil, although, they grow best in well-drained loamy ground. The flowers are not so long-lived on light land as of those that are grown on loamy soil. On ground containing a lot of clay, sand should be mixed in freely along with compost or other organic matter. 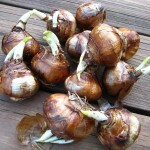 Early through middle fall is the best time to plant the bulbs in the garden. Their size determines the depth at which they should be planted. Large bulbs should be covered no less than 10-13cm (4-5 inch), medium sizes should have a covering of 8-10cm (3-4 inch) and smaller ones with 5-8cm (2-3 inch). One of the most common mistakes is to plant them too close to the surface. Narcissus tazetta bulbs can be left undisturbed for many years until they become so crowded that they fail to bloom abundantly. Usually, they need to be lifted at the end of 3 or 4 years. When they are planted in grass or woodland, they should be set further apart so that they can be left undisturbed for a longer period of time. The best flowers are obtained by lifting and replanting them annually or in alternate years, as soon as the leaves have died down. 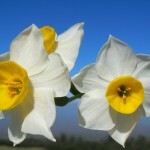 Irrigation: Water Narcissus tazetta from fall until spring while it is actively growing and when rain is insufficient. Keep the soil moist by watering it with 3cm (1 inch) of water when the soil is dry to the touch 5 to 8cm (2-3 inch) deep. Fertilising: Apply low-nitrogen, high-potassium fertiliser after blooming if bloom performance was poor. 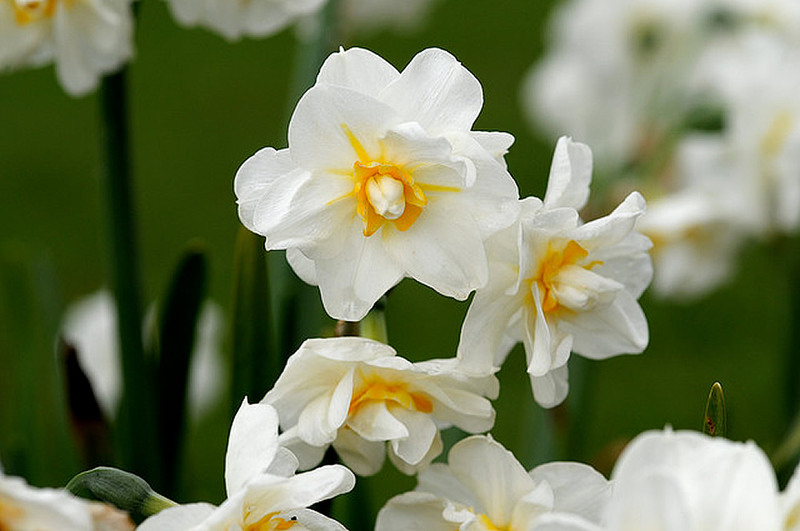 Feed Narcissus tazetta with a bulb fertilizer or an all-purpose fertiliser after they finish blooming and the flowers have faded. Sprinkle the fertilizer around the foliage and, because nutrient rates differ among fertilisers, use the recommended rate as stated on the package label. Repeat every two weeks for two months for a total of four feedings; however, do not fertilise after the foliage turns yellow. Propagation: Narcissus tazetta propagate by division or separation. Divide them after flowering or in the fall. Divide Narcissus tazetta if the clump is overgrown and produced fewer blooms than previous years. Simply dig up the bulbs with a garden fork and break off the small bulb offsets from the main bulb with your hands. 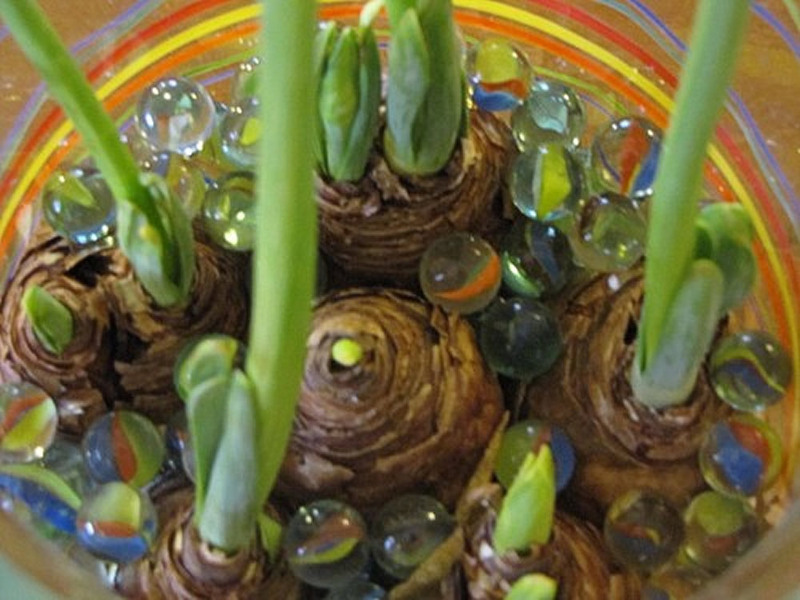 Replant firm bulbs immediately and discard soft ones. 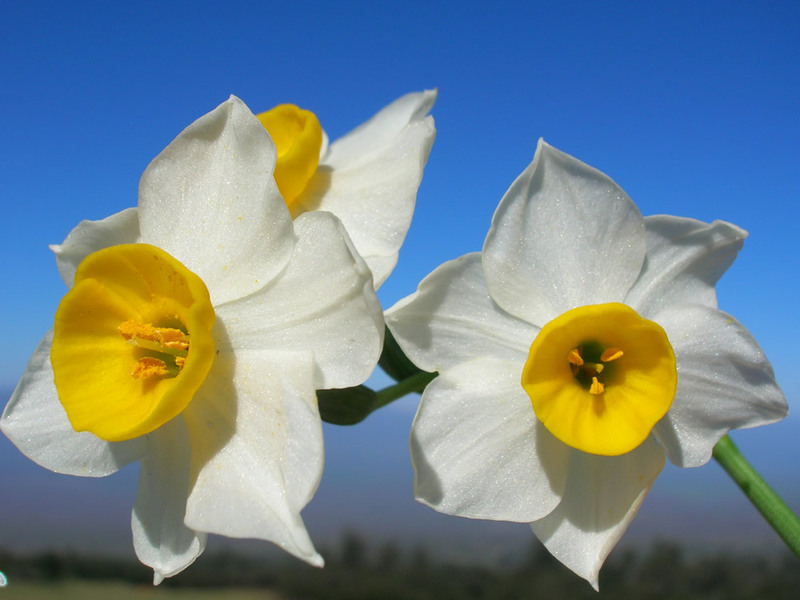 Narcissus bulbs are planted with their bases 13cm (5 inch) deep and spaced 5 to 8cm (1-3 inch) apart. 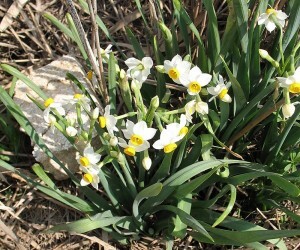 Narcissus tazetta is generally free of problems in good soil, but prone to diseases in wet soils. Mammal pests generally avoid this plant. The main enemy from which the Narcissus tazetta seems to suffer is the fly Merodon equestris (Narcissus bulb flies), the grub of which lays an egg in or near the bulb, which then forms the food of the larva. This pest causes serious damage in Holland and the south of England. Treatment: There is now no chemical preventative or curative for this pest available to the amateur grower. Hot Water Treatment will kill the grubs within the bulb but the damage has already been done. However, it may still be possible to save them by preventing infestation. If this pest is a problem in local area, consider covering the beds with either fleece or enviromesh to prevent the fly reaching the foliage to lay its eggs. This solution will not be effective against flies that emerge from the ground when the cover is in place. Bulb scale mite can become a serious problem with the culture of many house plants or orchids. It is a light coloured mite which is only just visible to the naked eye and is likely to found only on Narcissus tazetta in storage above 17°C (63°F), where it attacks the top third of the bulb. Treatment: It is killed by Hot Water Treatment and may controlled by an insecticide approved for that purpose. Bulb Mites (Rhizoglyphus and Histiostoma spp) usually only attacks bulbs in storage which are already damaged by fungal infection. Treatment: Control is achieved by good hygiene. Slugs and Snails are an increasing problem for Narcissus tazetta growers where although causing normally minor damage to the foliage they may also be a vector in the spread of virus disease from already infected plants. 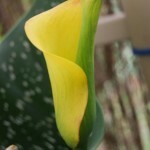 They can create serious damage, usually overnight, to the flowers. Dityenchus dipsaci (Eelworm or Stem Nematodes) is the most devastating pest of Narcissus tazetta. The Eelworm is not visible to the naked eye and the first symptoms are small yellow raised and lumpy lesions on the edges of leaves or stems. This is usually accompanied by large areas of the beds with weak growth, stunted plants or even no growth is seen. Bulbs cut across will show brown rings where the individual scales have been attacked by the nematodes. Treatment: Infected plants should be destroyed and care taken not to transfer the infection on boots or clothing. There is no chemical treatment of Eelworm in the ground and infected areas should not be reused for growing these plants. Hot Water Treatment will kill the nematodes but this requires a high temperature, very careful temperature control and the use of appropriate chemicals within the solution. Basal rot is an fungal disease caused by Fusarium oxysporum. This is the most serious disease of the Narcissus tazetta plants. The initial symptoms is the premature dying back of the foliage which when examination or at lifting time reveals a soft or mummified bulb containing a chocolate brown rot spreading upwards from the base plate. At this point recovery of the bulb usually becomes impossible. The bulbs can become infected in storage or after planting and spores become widespread and are viable for over ten years in the soil. Treatment: Control of this disease is very difficult even commercially. The avoidance of fresh manure or excessive nitrogen is essential and the early lifting of the bulbs is preferred. These should immediately be sprayed with a suitable fungicide and dried rapidly in a good air-flow by using fans. Storage should then be at a low temperature of 17-18°C (63-64°F) with planting in late autumn when soil temperatures are lower. Bulbs in storage should be inspected regularly and soft ones destroyed. Do not plant bulbs that have white or pink fungus on them. Purchase and plant hot water treated bulbs. Neck rot is a less common than basal rot. This disease spreads from the neck of the bulb towards the main body. There is more than one cause. Fusarium,(basal rot), enicillium, and botrytis (smoulder) are all implicated but usually separately. Treatment: The avoidance of fresh manure or excessive nitrogen is essential and the early lifting of the bulbs is preferred. These should immediately be sprayed with a suitable fungicide and dried rapidly in a good air-flow by using fans. Storage should then be at a low temperature of 17-18°C (63-64°F) with planting in late autumn when soil temperatures are lower. Bulbs in storage should be inspected regularly and soft ones destroyed. Smoulder is a disease caused by Botrytis narcissiola. Infestation will result in a lower bulb yield and unshowable flowers until the disease is eradicated. The symptoms are the appearance of a mass of grey spores as the leaves emerge from the bulb, causing the leaves to stick together. It is most likely to occur in cold, wet weather. The flowers are often spotted and the leaves can be polled away from the bulb revealing a grey mould at the base. It can also occur later in the season in cold conditions when it is less easy to spot. Treatment: The primary infection usually occurs in the previous year so control is by Hot Water Treatment and foliar spray with an appropriate fungicide while the bulbs are in growth. Dead foliage should be removed from the beds that are left down for a second year. Leaf scorch is a disease caused by Stagonospora curtissii. The symptoms are leaf tips that become reddish brown with a yellow border. The flowers may become spotted and there is usually premature die back. Treatment: Control is by application of an appropriate foliar fungicide spray and Hot Water Treatment. Apply thiophanate methyl as new leaves emerge. There are a large number of viral diseases that affects Narcissus tazetta. The most common is yellow stripe virus. It is identified by yellow stripes on the green foliage which is more apparent as the foliage emerges and which often disappears as the season progresses. Other common viruses are cucumber mosaic virus, white streak virus and tobacco rattle virus. In some cases the flowers is also affected with breaking or light patches on the petals or dark streaks. In most cases even though the flowers are not affected there will be a loss of vigour and reduced yield in the plants involved. Treatment: There are several vectors that transmit the various viral diseases including aphids above ground and nematodes and millipedes below ground. The spread of the disease may be slow or rapid throughout the collection but the only solution is to rigorously remove any obviously infected plants. It should be assumed that any very old cultivars are likely to be infected by viral diseases of this type and therefore it is probably wise to not grow them together with a modern collection. It is when the plant is stressed that the virus will normally be able to be most easily seen. Control is by destroying any infected bulbs and by controlling the agents that cause the spread of the disease by spraying regularly throughout the growing season to kill aphids and Hot Water Treatment for the control of nematodes. Recommended varieties: All of the varieties named bellow bear three or four blooms per stalk. Narcissus tazetta ‘Cheerfulness’ is a pale, creamy yellow, many-petaled form with orange petals in the centre. Narcissus tazetta ‘Cragford’ has white petaled with a very short brilliant orange-scarlet cup. Narcissus tazetta ‘Geranium’ has white petaled with an orange-red cup. Narcissus tazetta ‘Paperwhite’ has white petals with a short white cup. Narcissus tazetta ‘Soleil d’Or’ has yellow petals with an orange cup. Toxicity: All parts of the Narcissus tazetta plant are poisonous and can cause a form of hyperactive seizure that leads to depression and possibly coma. Uses and display: The Narcissus tazetta is one of the easiest to grow in pots in the greenhouse, conservatory and house in the winter and early spring. By potting them at intervals of a few weeks, from end of summer until the early autumn, it is possible to have blooming plants from early winter until the early of spring. It is commercially grown outdoors for cut flowers and essential oil extraction that is used in perfume industry. The flowers of Narcissus tazetta are appreciates as cut flowers for early spring bouquets – some varieties are especially long lasting. 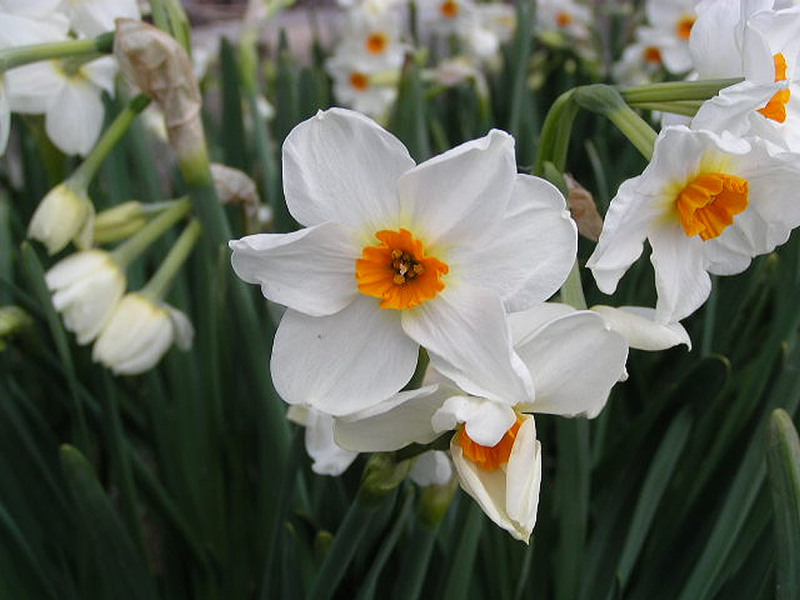 Narcissus tazetta are used in landscaping naturalistic garden, rock gardens or outdoor containers displays. Distribution and habitat: Freesia refracta is native to the the winter rainfall region of South Africa where it is found growing in sandy or stony soils amongst dune scrub or at forest edges, usually in light shade. It is a relatively common species of the dry interior valleys of the Western Cape. Freesia refracta was widely naturalised in mild climates being introduced as a garden plant. Description: Freesia refracta are herbaceous plants which grow from a corm 1–2.5cm (0.4-1 inch) diameter, which sends up a tuft of narrow, strap-like leaves 10–30cm (4-12 inch) long and a sparsely branched stem 10–40cm (4-16 inch) tall bearing a few leaves and a loose one-sided spike of flowers with six tepals. 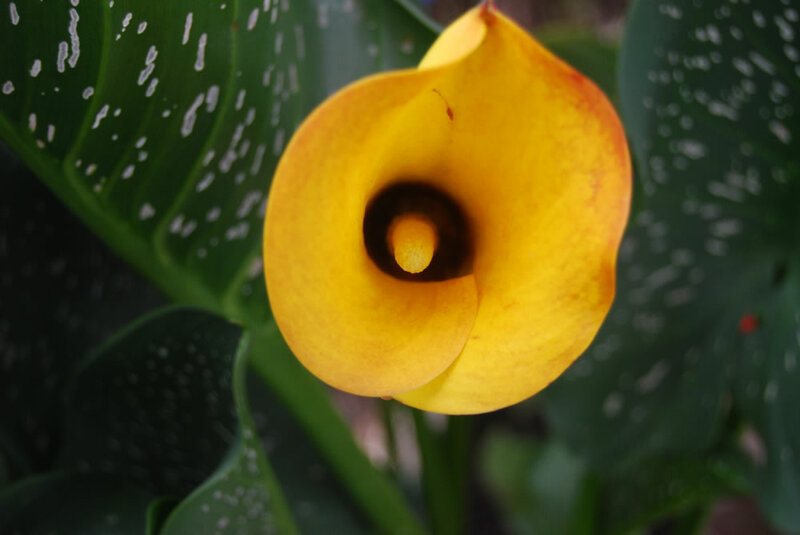 They have fragrant narrowly funnel-shaped flowers that bloom facing upwards because their stems have the unusual habit of turning at right angles just below the bottom flower. This causes the upper portion of the stem to grow almost parallel with the ground. The flowers start to bloom in succession from the base to top of the inflorescence. Freesia refracta flower is cream with a gold throat. This is the most sweetly scented and has cultivars in pink, red, purple, beige, gold and pure white. Houseplant care: Freesia refracta corms are easy to force into bloom. Start planting freesia in late summer or early fall for winter or early-spring blooms. After the flowers have faded, it is important to cut off the flower head but not the green stalk. Allow the foliage to die back naturally as the plant produce new offsets. Light: Place Freesia refracta in bright light spot, but out of hot afternoon direct sun. This plant will appreciate some cool, direct morning sunlight. Temperature: Keep Freesia refracta plants in cool room with temperatures ranging between 16-18°C (60-65°F) and moderate humidity while they are growing and flowering. Blooms will last for weeks if kept at a maximum of 18°C (65°F). Freesia refracta plants need a mild winter temperature of around 10°C (50°F). Water: Water well through the growing season but cut back during flowering time. Stop watering altogether once the foliage dies down and dries up. Do not overwater because it will cause the corms to rot. Feeding: Feed the Freesia refracta plants every two weeks, beginning with the first show of flower buds till the end of flowering. Use a high-potassium liquid fertilizer diluted by half. Potting and repotting: Choose a shallow pot (at least 8cm (3 inch) deep – approximate three times the height of the corm) with drainage holes in the bottom. Fill the pot loosely with potting mix. In early autumn, set Freesia refracta corms 5cm (2 inch) apart, pointed end up. Do not press the corms into the mix, keep the potting mixture loose so the roots can grow through it easily. Top corms with 2.5 cm (1 inch) of additional potting mix. Place the pot in a bright, warm location on temperature around 27°C (80°F) and keep the potting mixture barely moist until new growth appear in about 8 weeks. When shoots reach about 5cm (2 inch) tall, move the pot to a cooler room with about 16-18°C (60-65°F) in a bright window for a couple weeks until flower buds form. Turn the pot every couple days for even growth. 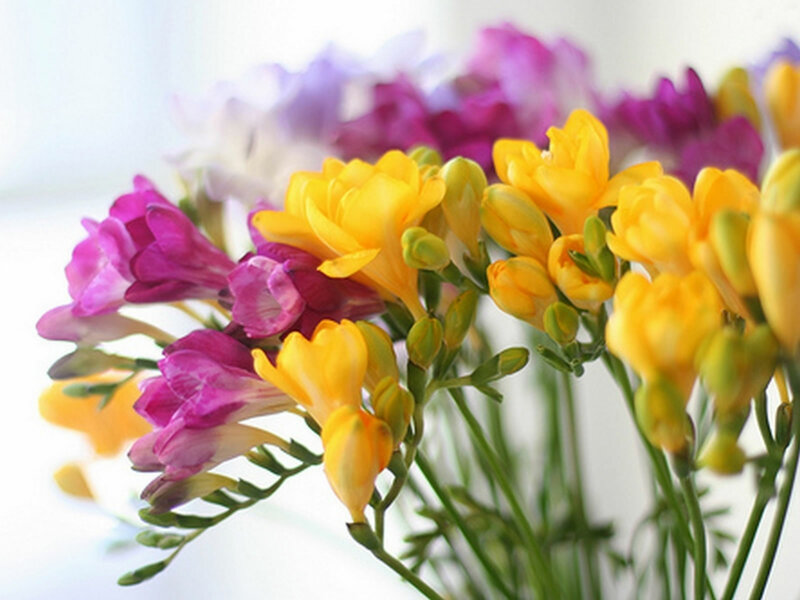 When in full bloom, keep freesias in a bright location out of direct sun to prolong the bloom. Freesia refracta corms will not bloom a second time indoors. They do produce offsets that can be planted. After flowering, allow the foliage to die back naturally, cut off the stems, then remove and store the offsets in a dry place. Alternatively, the clumps can be left in their container undisturbed for up to 3 years or until they become crowded when they should be divided in late summer. Freesia refracta will rest for a few months before beginning the next growing cycle in the spring. 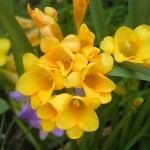 Gardening: In zone 8 and colder, plant Freesia refracta in the spring rather than in autumn. These bulbs will not survive outside in regions colder than zone 9 as they are frost tender and need protection in very cold climates. Location: Place Freesia refracta in a sunny location, preferably one that receives morning sun and afternoon shade for the strongest stems and best flower production. Soil: Freesia refracta require planting sites that drain well. These plants do not thrive in soggy soil. Amend the soil with the addition of organic material to raise the soil level 5-8cm (2-3inch) for improved drainage. Peat moss, compost, ground bark or decomposed manure all work well and are widely available. Dig holes and plant the corms 5cm (2 inch) deep and 8cm (3 inch) apart. Position the corms with the pointy end facing up. After planting, water well to settle the soil around the bulbs. Roots and sprints will form in a few weeks depending on soil and air temperatures. After blooming has finished for the season leave the foliage in place; do not cut it off. The leaves will gather sunlight, create food through photosynthesis and strengthen the bulb for the future. In warm climates leave the bulb clumps undisturbed for up to 3 years or until they become crowded and then divide them in late summer. In colder areas, lift corms after the foliage dies down, store them over the winter and replant in spring when danger of frost is past. Irrigation: Water well through the growing season but cut back during flowering time. Stop watering altogether once the foliage dies down and dries up. Fertilising: A liquid fertiliser can be applied as soon as the first growth appears above ground. Winter storage: Later in the summer the leaves will yellow and die back as the plant slips into dormancy. Foliage many be removed at this point. Freesia refracta will rest (remain dormant) for a few months before beginning the next growing cycle. Cut off all remaining foliage and stalks after lifting. Discard all corms which appear diseased. Dust the corms with a fungicide and an insecticide. Pack them in wooden creates or cardboard boxes containing layers of dry wood shavings, sand or sawdust and store them in a sheltered place dried and with a minimum of 10°C (50°F). Plant the corms again as indicated above. Propagation: Grow Freesia refracta from seed or corms planted in early autumn. It is preferable to purchase fat, thick corms in the autumn or early winter to plant them. Fresh seed germinates readily in 4 to 5 weeks. Some plants flower in their second season, most in their third. Freesia refracta is free-flowering, sets seed freely and seeds itself pretty freely too, and, with the production of cormels, a pot will be filled with plants in 2 to 3 years. Clumps are best lifted and divided every three years. 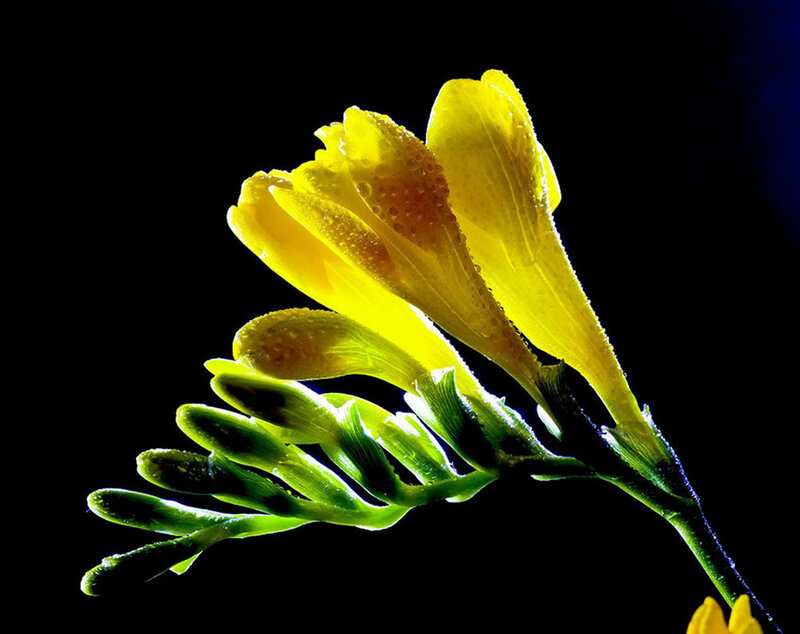 Problems: Protect Freesia refracta against aphids, mites and thrips as they can transmit viral diseases to which freesias are very susceptible. Slugs and snails can also damage the leaves and a fungal dry rot attacks the corms. Cutting flowers: Snip a few flowers for vase arrangements, as the plants will not be hurt. Freesia refracta flowers typically last 4 to 12 days, depending on their care, their maturity at the time of harvest and the environmental conditions in which they are displayed. If the buds on the lateral (branching) stems develop and open, the blooms generally will not be as large, be as colorful or last as long as the blooms on the main stem. For best results, place Freesia refracta flowers immediately into a nutrient solution formulated especially for bulb flowers. 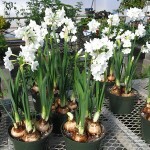 Use a standard flower-food solution if a bulb-flower-specific solution is not available. Prepare the flower food solution with cold, non-fluoridated water. Fluoride can inhibit bloom development and opening and cause flower and leaf tip burn. Change the nutrient solution in vase every other day or so and check daily the water level. When changing the nutrient solution in vase, recut the stems at least 1cm (0.4 inch) to ensure effective water uptake. Also, protect these flowers from sources of ethylene gas emanated by ripening fruit, decaying flowers and foliage, automobile exhaust and tobacco smoke. 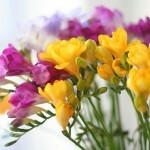 Display the Freesia refracta floral arrangement out of direct sunlight and away from air/heat vents. Remove florets as they fade. Mist blooms daily and place the flowers in the coolest room at night. 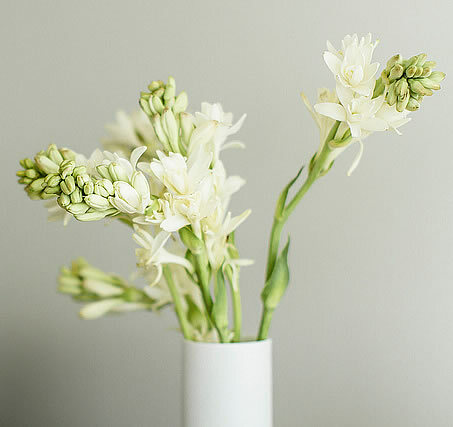 Purchasing list: Buy cut Freesia refracta when the first bud on each stem is just beginning to open and at least two additional buds are showing color. If the flowers are cut too tight, many buds may not open. Check inflorescences, stems and leaves for bruising, browning, yellowing, mold and rot. Choose corms that are firm – not soft or mushy. Do not buy any corms that are sprouting. Note: Freesia refracta is a species much used in hybridation. The fragrance of Freesia refracta is incomparable in that it contains a cheerful bouquet of peppery zing and floral freshness projected at the right intensity, a delicious aroma that radiates for a long distance. High in linalool, a major component in all freesia varieties, it emits a refreshing, floral woody aroma with a subtle citrusy-terpenic note. But even within the species there are differences: the white flowers tend to smell more spicy, the colorful ones greener with the sweetness of crushed leaves and grass. The yellow flowered breeds “Gold Flame”, “Aladdin” and “Rijnveld Golden Yellow” emit volatile compounds to abundance, while some others such as “Rose Marie”, “Volcano” and “Bleu Heaven” are only noted for their flamboyant appearence rather than their scent. 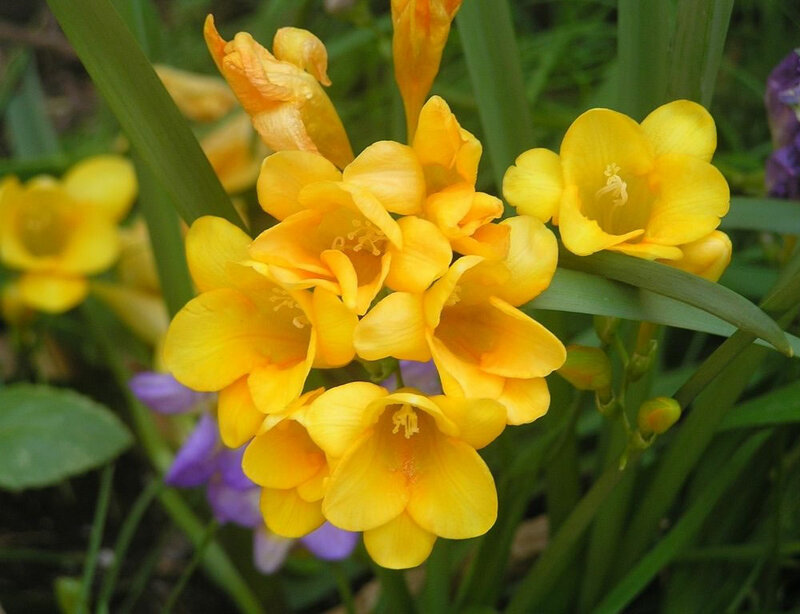 Availability: Freesia refracta are sold as container plants, cut flowers and dormant bulbs for summer bedding. 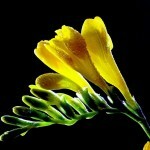 Toxicity: All parts of the Freesia refracta are poisonous if ingested. Uses and display: The flower stems habit of Freesia refracta make them lovely to look down into in a garden setting and ideal for arrangements. These plants are grown indoors in pots or in gardens in mild climates. 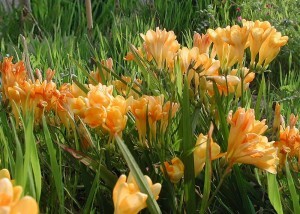 In garden, Freesia refracta plants are attractive to bees, butterflies and birds. They look best in a massed display and are excellent cut flowers appreciated as long living vase flowers and for their fragrance. This plant is a great favourite for cottage gardens, borders or anywhere around the garden. It makes a wonderful pot plant that can be enjoyed on a sunny patio or sunk into the garden during its growing season or just for spring and removed and stored dry during summer or it can be grown permanently outdoors in pockets of the rock garden. 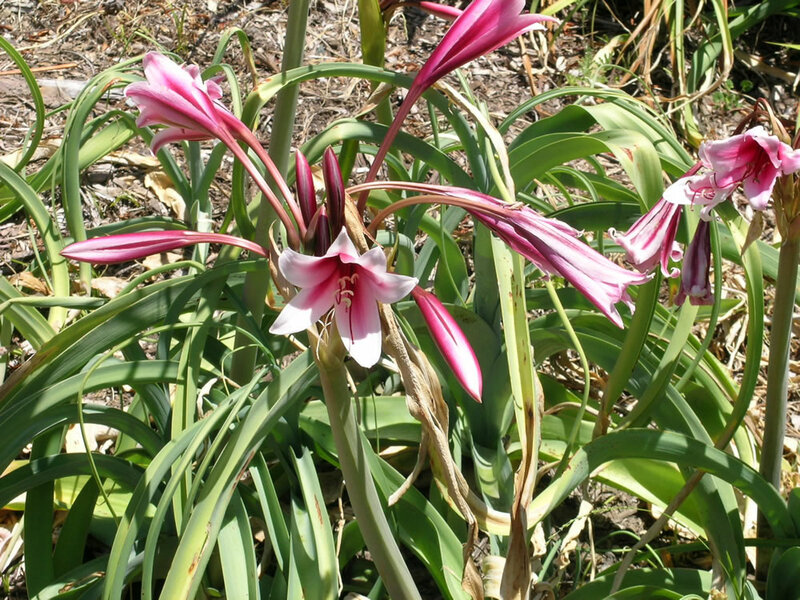 Distribution and habitat: Crinum bulbispermum is a herbaceous plant native to South Africa. It is naturalized in other parts of the world, such as southern North America. In nature it grows along stream banks and in swampy grasslands that usually dry out during the winter months when these plants are dormant. Description: Crinum bulbispermum has a large 8 to 10cm (3-4 inch) tick oval bulb with ‘neck’ up to 15cm (6 inch) or even 30cm (12 inch) long from which rise about 10 spreading, sword-shaped leaves. Each slender pointed leaf is 60-79cm (24-31 inch) long and 5-8cm (2-3 inch) wide. The inflorescence is an umbel with 8–13 flowers, borne on a scape 40–75cm (16-30 inch) tall. The flowers are funnel shaped and sickly-sweet scented. Flower colour is white, deeply ringed with pink on the outer surface of the petals. The species generally grown as indoor plants usually keep their leaves for at least one full year, after which the leaves tend to slowly become shabby and untidy. When finally drop off or are picked off, fresh new leaves appear. the plants therefore need considerable attention to keep the foliage looking presentable. Clusters of five to eight impressive trumpet shaped flowers are normally produced in autumn on 60-90cm (24-35 inch) long flower stalks. Each of these long stalks may be 2cm (0.8 inch) tick and the flowers are usually about 15cm (6 inch) across with mouths up to 15cm (6 inch) across. The handsome display of blossom last for about a month. Plants may take three to four years to reach flowering size. Once the flowers fall they are followed by the large attractive pink fruit capsules containing few to many bulbous seeds which germinate as soon as they fall to the ground. 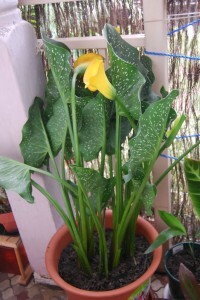 Houseplant care: When section of leaves turn yellow or show signs of damage, cut away the unsightly portion. Entire leaves need not to be cut away unless it is really necessary. 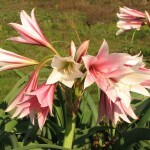 Light: Crinum bulbispermum need at least three hours a day of direct sunlight. Inadequate light inhibits flowering and can cause unnaturally elongated leaves. 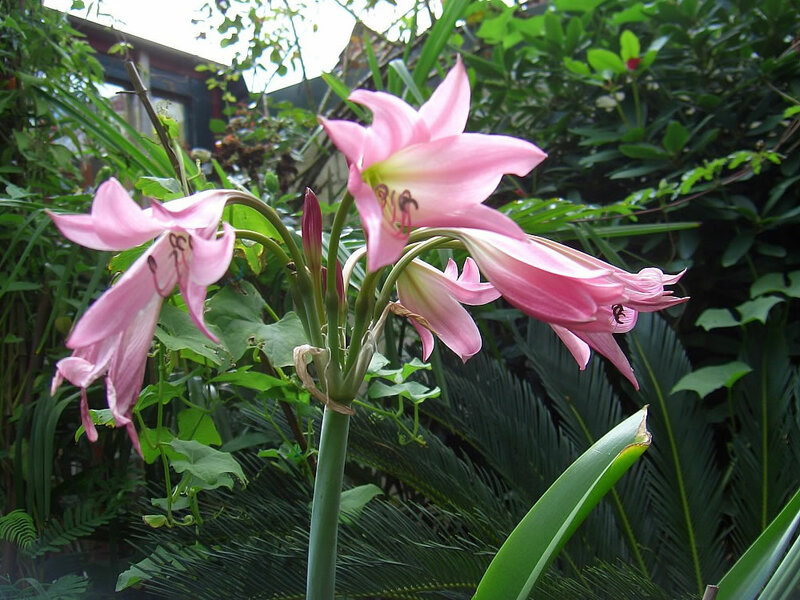 Temperature: Crinum bulbispermum plants grow well in normal room temperatures for most of the year, but need a three months rest period at 10°C (50°F) in midwinter. Watering: During the active growth period water plentifully, but never let the pot to stand in water. During the winter rest period give just enough water to prevent the potting mixture from drying out. Feeding: Apply liquid fertilised once every three weeks during the active growth period only. Potting and repotting: Use a soil based potting mixture. Place the bulb in a pot that is only a couple of centimetres (0.8 inch) wider than the bulb. If bulbs are small, plant two or three in a 25-30cm (10-12 inch) pot or tub, standing each one half in and half out of the potting mixture. Leave plenty of space above the potting mixture, which will be forced upwards as more roots are produced. Once they are potted, Crinum bulbispermum plants are most likely to flourish if left undisturbed. Do not attend to separate bulb clumps or to move plants into bigger pots for at least three years. Instead give the plants an annual spring top-dressing. Gardening: This is one of the most commonly cultivated species, grown as an ornamental plant for its flowers. The species is hardy to zone 6b if the bulb is protected. Location: Crinum bulbispermum plants require full sun or semi-shaded position. Soil: Rich and well drained but generally tolerant of a wide range. 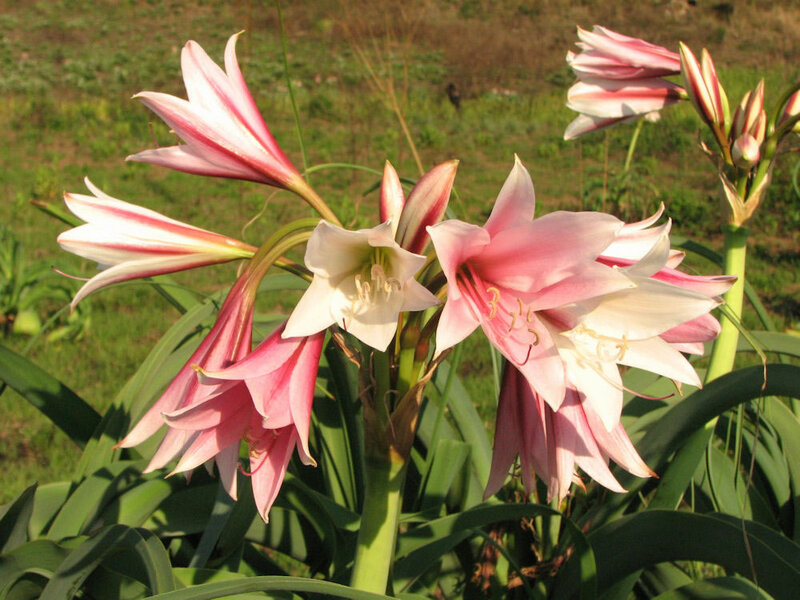 Adult Crinum bulbispermum plants are best grown in deep soils that receive and hold a lot of water during the growing season. They can be transplanted but ideally should be left to grow in the same place without disturbance. It does prefer the wetter places and does very well if planted in soggy soils. 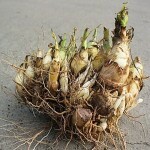 Plant Crinum bulbispermum with the top of the bulb just above the soil surface and 30cm (12 inch) apart each other. Irrigation: Although this plant is very drought tolerant once established, it performs best if the soil is kept moist once the foliage appears until the time when the flowers have finished. They can endure periods of drought during their growing season without adverse effects. Fertilise: Top dress annually in Spring with a general purpose fertiliser. 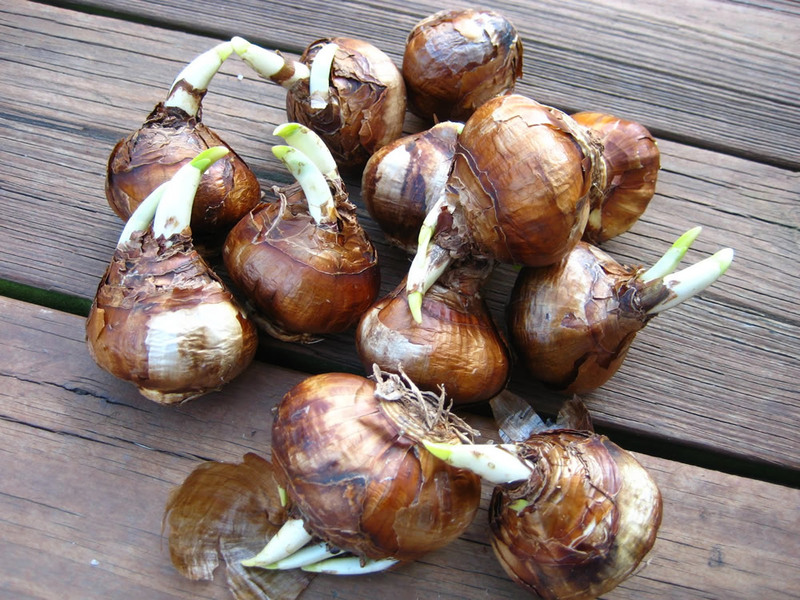 Propagation: Clumps of bulbs form as the plant age. To propagate, divide overcrowded clumps in spring by pulling them apart gently. Pot the bulbs up either singly or in groups of two or three. Then work the potting mixture around the fleshy roots and press it down thoroughly. For six weeks after potting up, water sparingly. Thereafter, treat the plants as adults. 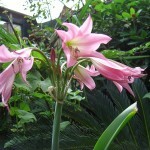 Crinum bulbispermum cv. ‘Album’ has pure white blooms. Crinum bulbispermum cv. ‘Backup Mother’ – vigorous. Flowers medium pink with white throat. Crinum bulbispermum cv. ‘Spotty’ – flowers rose-purple with odd random white spots and unpigmented, short stripes. 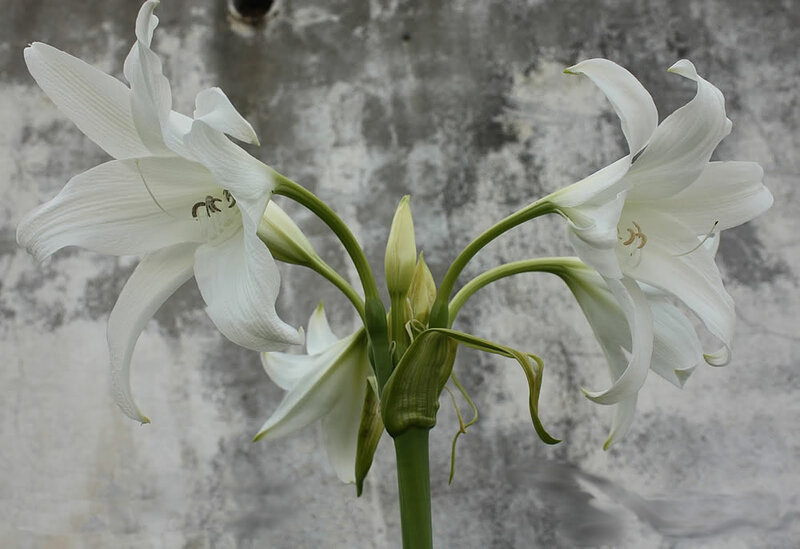 Crinum × powellii is a hybrid of which parentage is Crinum bulbispermum × Crinum moorei. 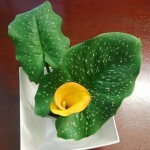 It has 10cm (4 inch) tick globular bulb and up to 20 sword shaped leaves. Each leaf is about 1m long and 8-10cm (3-4 inch) wide near the base. The flowers are pinkish red with green shading near the base of the petals. Uses and display: This is a good plant for swamp or water gardens. It can be used in designing cottage or informal gardens or as flower borders or beds. They also make good container plants. Distribution and habitat: Begonia × tuberhybrida are a group of Begonia cultivars, regarded as some of the most spectacular of the genus. This is by the far the most widely grown type of tuberous begonias and it is also probably the most popular type of begonia worldwide. Over many decades of hybridizing work, various species traits were combined to create what we know as the tuberhybrida type today. The Begonias are native to moist subtropical and tropical climates. In cooler climates, Begonia × tuberhybrida plants are commonly grown indoors as ornamental houseplants or cultivated outside in summertime for their bright colorful flowers. Description: Begonia × tuberhybrida are grown for their handsome flowers. Plants truly characteristics of the group have swollen underground stem (tuber) and are deciduous with a period of total dormancy every year. Begonia × tuberhybrida forms usually have fleshy, erect stems up to 2cm (0.8 inch) thick and 38cm (15 inch) tall, with a few hybrids having a trailing habit. The soft easy damage, pointed-oval leaves 15-30cm (6-12 inch) long and 8-13cm (3-5 inch) wide are dark green but vein areas in some forms are a paler green. Flowers bloom in summer on 15cm (6 inch) long flower stalk arising from leaf axils. Male flowers are sometimes many-petaled and up to 15cm (6 inch) across, whereas female flowers are single-layered and up to only 5cm (2 inch) across. Flower colours is white or any shade of pink, red, yellow or orange. All forms are dormant in winter. Houseplant care: At the end of the growing season, the stem and leaves of deciduous Begonia × tuberhybrida will gradually fall off. Do not pull away the stems since this could damage the tuber. Use canes to support the heavy flowers stems. Blooms will be encouraged to grow larger if all female flower heads are removed (these are easily recognized by the seed capsule behind the petals). Light: Give Begonia × tuberhybrida plants bright filtered light all year round. Light is not important during the dormant period. Temperature: During the active growth period normal room temperatures are suitable for Begonia × tuberhybrida. In temperatures above 18°C (64°F) stand pots on trays of moist pebbles or suspend saucers of water under hanging basket. During the winter keep dormant forms at a temperature of about 13°C (55°F). Watering: Water actively growing plants moderately, allowing the top couple of centimetres (0.8 inch) of the potting mixture to dry out before watering again. As growth slows down, reduce amounts of water gradually. Stop watering when the foliage begin to turn yellow and plant start to loose their foliage for winter dormancy. Avoid getting water on leaves and flowers except for occasional necessary rinsing for grooming purposes. Start the tubers of Begonia × tuberhybrida forms into growth in early spring by planting several in shallow trays of moistened peat moss, setting the tubers (with the concave side upwards) half in and half out of the peat moss. Stand each tray in bright filtered light for about three or four weeks, when about 5cm (2 inch) of the top growth will have been made. Then move each specimen into an 8 or 10cm (3-4 inch) pot of the recommended potting mixture for adult plants. The large-flowered hybrids may need to be moved into larger pots two or three times during the summer, but most other kinds can spend the entire season in same container. Gardening: The ideal conditions for tuberous begonias are areas where evening temperatures do not fall below 15°C (59°F) and where day temperatures are less than 27°C (81°F)(on average). These plants are a definite challenge in very warm climates. They prefer a mild summer climate and are totally intolerant of high temperatures or very high humidity levels. The plants are quite brittle and staking helps them tolerate violent weather. The single female flowers are removed before seed forms to keep the plant blooming. The females are on either side of the double male flowers. In warm climates the tubers of these plants can be planted in fall for use as a cool season bedding plant. Location: Begonia × tuberhybrida grow best in partial shade. Exposure to excessive sunlight can result in burnt flowers and leaves. Too much shade results in foliage that is very lush with few flowers. Soil: Begonia × tuberhybrida plants need rich, well-drained soil with high organic matter. Amend the soil with leaf mold or peat moss. Plant the tubers “eyes up” indoors in early spring in flats of peat moss and sand. Place the trays in a dark location at 18°C (65°F) until 3cm (1inch) tall shoots appear. Cover the shoots with additional mix and move the trays to a lighted location at the same temperature. Plant them outdoors after all frost danger has passed. Plant Begonia × tuberhybrida with 15 to 30cm (6-12 inch) space between them. Irrigation: The plants need frequent watering, but excess causes flower bud drop. Allow soil to dry between waterings. 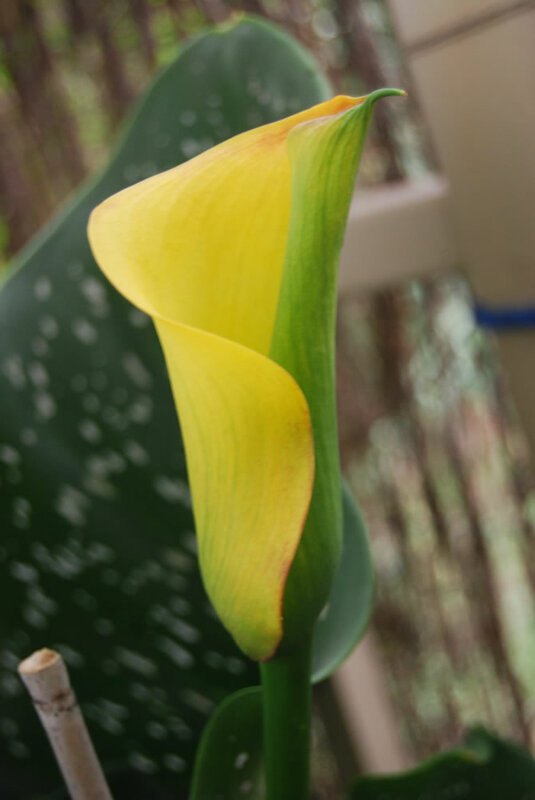 Stop watering when leaves start to turn yellow and the stems begin to fall. Do not remove stems at this time. Fertilise: They should be fertilized weekly with quarter strength fertilizer during all their active growing period. Stop fertilizing when plants shows signs of winding down or a month or so before you expect them to go dormant. Dormancy: The tubers are dug when the leaves and stems fall off. Do not break off the stems, but wait until they fall off naturally. 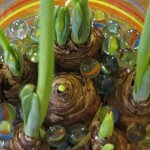 Injured bulbs should be exposed to air to allow the area to dry. Wash tubers and allow them to dry before storing. Dried tubers are covered with peat or sand and stored at 7 to 15°C (45-60°F). Propagation: To propagate Begonia × tuberhybrida forms cut a large tuber into two or more sections in the spring, making sure that each has a growing point. Treat the cut ends of the sections with fungicide to prevent root. Allow the pieces to dry several days and then pot each one exactly as if it were a whole tuber. Pinch off the first flower buds. Alternativelly take a stem cutting. Stem cuttings are made from surplus shoots which arise from the tuber. Stem tips may also be used. The cuttings are 8cm (3 inch) long and are cut off just below a node. Sand may be used as the rooting media. Keep cuttings out of direct sun and in temperatures between 15 to 18°C (60-65°F). Rooting occurs in five weeks. Problems: Begonia × tuberhybrida has long-term health usually not affected by pests. Tubers will rot if they are too wet prior to planting. Treatment: Keep them in an airy cool place over winter (do not expose to frost). 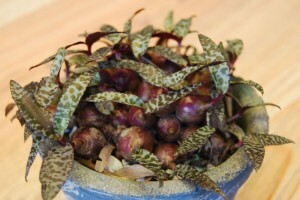 Begonia × tuberhybrida plants can also rot if over-watered. Yellow leaves are a result of either too much or too little water. Leaf loss may be caused by lack of light if stems are thin and leggy, too much heat if leaves are dry or too much water if leaves are wilted and rotten. Loss of buds and leaves turning brown at the tips are usually caused by lack of humidity. These plants are susceptible to powdery mildew (a white powder that forms on the leaves) caused by bad ventilation. Treatment: Improve the air circulation or use a suitable fungicide as a preventative measure. Thrips cause irregular reddish brown lines on the upper sides of the leaves. Spots form on the undersides of the leaves, especially along the main veins. The leaves may be deformed. Black vine weevil grub eats the roots causing wilting and death. Mites stunt the new growth. Treatment: Use a suitable pesticide that treat each of these pests effectively. 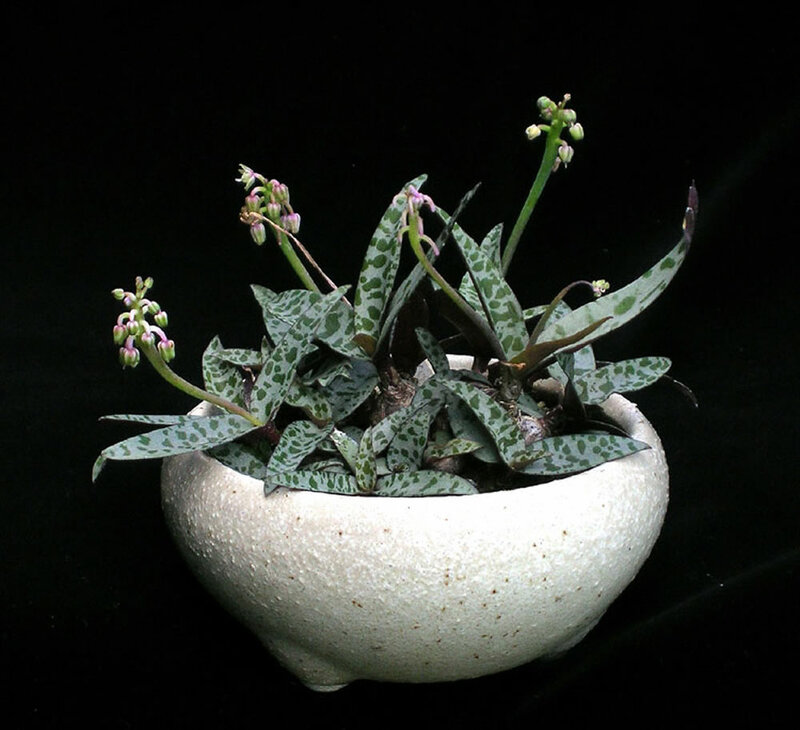 Avalability: Begonia × tuberhybrida plants may be available as either a mature, blooming plant or dormant tubers. Uses and display: Begonia × tuberhybrida group are temporary plants making spectacular displays for the summer and autumn. Begonia × tuberhybrida are usually grown in pots, but there are also hanging basket varieties. Begonias can be grown in a sheltered shadehouse, on a veranda, in a sun room or on a window ledge. 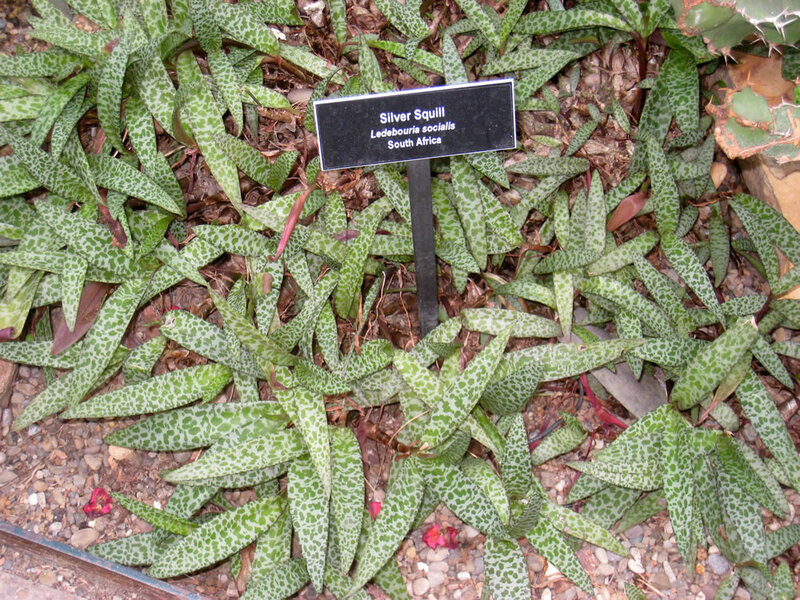 Distribution and habitat: Ledebouria socialis is a geophytic species of bulbous perennial plant native to the Eastern Cape Province of South Africa. It grows in arid savanna in summer-rainfall regions where it is found in fine to medium grained shallow to deep well drained humus rich sandy soil. It usually grows in shade mostly in closed evergreen woodland. This species has mottled leaves enabling it to blend into its thicket backdrop. 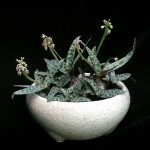 Description: Ledebouria socialis is a small evergreen perennial bulbs in thick clusters that survive drought as effectively as any succulent. It has fleshy, stalkless, broadly lance-shaped, pointed leaves 5-10cm (2-4 inch) long. Leaf upper surfaces are silvery blotched and banded with olive green and the undersides are deep violet. Dense clusters of tiny, green flowers edged with white are produced in spring on flower stalks 8-15cm (3-6 inch) long. The bulb is small, epigeal (exposed), about 1cm (0.4 inch) in diameter, purplish in colour with a transparent tunic. These plants produce offsets profusely, so that a tightly packet cluster of small bulbs can cover the surface of a pan of potting mixture within few years. Houseplant care: Ledebouria socialis is often cultivated as houseplant and grows well with minimal care. They do have a winter rest period, but their leaves remain decorative throughout the year. Light: Ledebouria socialis require bright light with three to four hours a day of direct sunlight. Temperature: During the active growth period, normal room temperatures are suitable for Ledebouria socialis plants. During the rest period keep them at 10-15°C (50-59°F), if possible. Watering: During the active growing period water them moderately, allowing the top centimetre (0.4 inch) or so of the potting mixture to dry out before watering again. During the rest period water these plants only enough to prevent the mixture from drying out. Feeding: Apply liquid fertiliser to Ledebouria socialis once a month during the active growing period. Potting and repotting: Use a soil based potting mixture and plant Ledebouria socialis bulbs in pans or half-pots. Pot up the bulbs in the spring, but no more than three bulbs in a single 10-15cm (4-6 inch) pot. Space the bulbs evenly over the surface and bury only the bottom half or each bulb in the potting mixture. During the fist four or six weeks do not feed the plants and water sparingly, allowing the top half or the potting mixture to dry out between waterings. When the new roots should be well established, treat the plants in the normal way. Break up overcrowded clumps every two or there years. 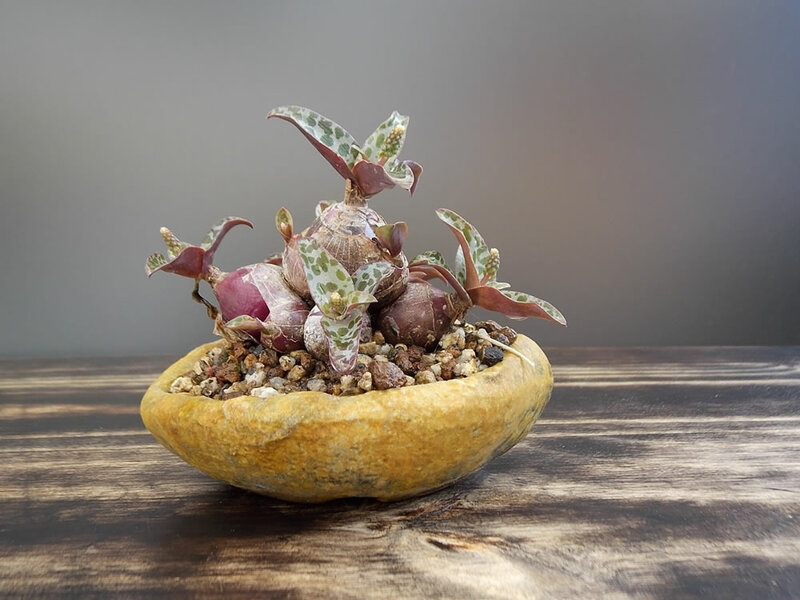 Propagation: To propagate Ledebouria socialis break bulbs away from clumps after the flowers have faded (normally in late spring) and pot them up as recommended above on Potting and repotting section. Toxicity: All parts of plant are poisonous if ingested. Uses: This plant is suitable for growing indoors. It is very happy sitting in window sill too. It can be grown outside where there is no danger of frost. It is drought-tolerant and therefore it is suitable for xeriscaping. Distribution and habitat: Polianthes tuberosa is a night-blooming plant thought to be native to Mexico. It is not known to exist naturally in the wild today. In its natural habitat it prefers sites with friable, sandy soil with organic matter mixed in. Description: Polianthes tuberosa is a plant related to the agaves. It is a herbaceous perennial tuber bulbous plant with erect leafy stems and broadly linear leaves. It grows in elongated spikes up to 45 cm (18 in) long that produce clusters of fragrant waxy white flowers that bloom from the bottom towards the top of the spike. 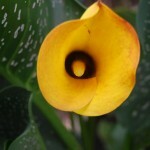 The tubular flowers, 2.5 to 5cm (1-2 inch) long, occur in pairs, up to 30 flowers in a spike at the ends of the stems. It has long, bright green leaves clustered at the base of the plant and smaller, clasping leaves along the stem. Bulbs that have bloomed once will not bloom again. Discard such old bulbs and replant the younger lateral crowns. Only mature bulbs will produce flowers. These younger offsets should flower in two years time prodded they are lifted and strip off the tiny bulbs attached to them after the first growing season. The heady and heavily scented blooms are produced in late summer or early autumn and are as versatile and long lasting in the garden and container as they are when cut for the vase. The flowers are perhaps the most powerfully scented of all flowers and will continue to produce and exhale perfume long after it has been picked. 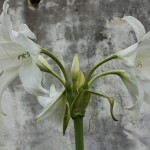 Several blooms can appear on each stem. The flowers have a mild fragrance during the day and a strong fragrance during the night and last about a month. Houseplant care: Polianthes tuberosa is suitable for containers growing as indoor plant. Consider adding a plant support if the floral spike gets too heavy after bloom stalks form. Cut off the foliage once it yellows and dies back naturally in later summer or early fall as the plant is going dormant during the winter. A new cycle should be started in spring. Light: Provide bright light for Polianthes tuberosa to successfully flower. It grows best with at least five to six hours of sunlight each day. To force the plant to flower in winter, proper lighting in essential and should be used artificial lighting to ensure the plant receives the light it needs. It will need the equivalent of 16 hours per day of natural light. Turn lights on only during the daytime when the plant would receive natural light if it were planted outdoors. Temperature: These plants require a temperature ranging between 21 and 24°C (70-75°F). Do not allow the temperature to drop under 15°C (59°F). Water: Water the pot from the top until the excess moisture drains from the bottom and into the drip tray. Empty the drip tray. Water Polianthes tuberosa when the top 1 to 3cm (0.5-1 inch) of potting mixture just begins to feel dry to the touch. Gradually reduce the watering in autumn when the foliage starts to yellow. Feeding: These plants will respond well to regular applications of liquid fertiliser every three weeks throughout the growing season. Potting and repotting: Pot the flowering bulb in a 15cm (6 inch) pot size filled with well draining potting mixture in mid-winter to early spring. Sow the Polianthes tuberosa bulb so the top of the bulb is 10cm (4 inch) beneath the soil surface. Water generously right after planting to soak the bulbs. Be sure that your pot has drainage holes in the bottom to prevent waterlogged roots. The planted bulbs will full bloom in roughly 4-6 months. The bulb has to be repotted every several years in clean pots and fresh potting mixture. 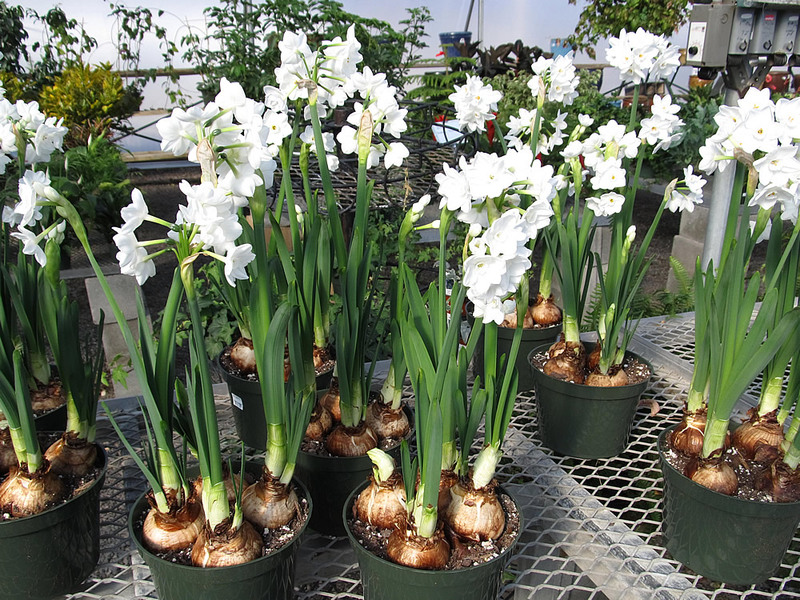 Repot these plants in spring when new bulbs can be separated for propagation proposes. 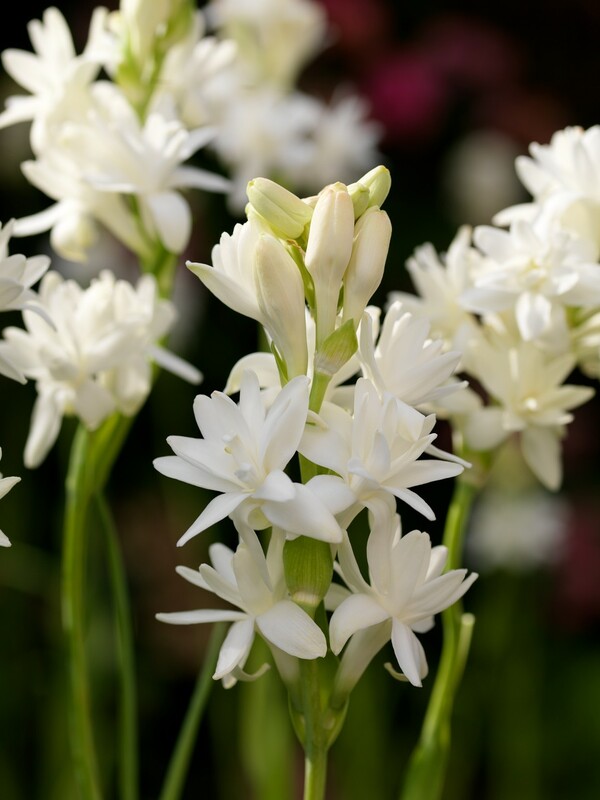 Garden Culture: Polianthes tuberosa are slow-growing, summer-flowering bulbs that need four to five months of warm weather and abundant moisture to bloom. In tropical climate, flowers can appear anytime from spring through fall. Polianthes tuberosa are warm climate plants, but will tolerate light frosts in the garden. The bulbs should be bought in late winter and early spring to get them on time for planting. 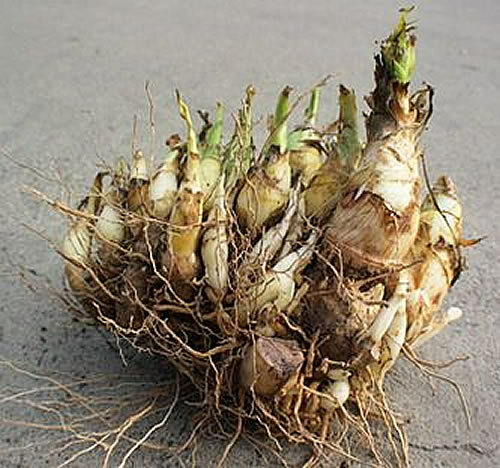 After flowering, do not remove the foliage as it continues to feed the bulb for next year’s growth. This plant will become dormant over the winter. The leaves can be removed only once they have yellowed completely late in fall. These bulbs can remain outside in places with light freezes if well mulched. Prepare the bulbs for dormancy period by gradually reducing water (in cold regions, about three weeks before the first frost is expected). At this point, if digging up the bulbs for the next season is intended or needed, do so now. Allow the bulbs to dry in the open air and shade for several days, then place them in a paper bag or cardbox box filled with peat moss for winter storage indoors. Provide a cool and dry storage area for winter. If grown in pots or containers, bulbs may be started indoors in early spring, bringing them outdoors to a sunny location after the threat of frost has passed. Position: These plants should be grown in full sun to part shade. They need full sun for about 6-8 hours during the day. For areas that reach summer highs temperatures of 35°C (95°F) or higher, plant these bulbs where they will receive partial shade during the hottest part of the day. Extreme heat can shrivel Polianthes tuberosa flowers or prevent buds from opening. 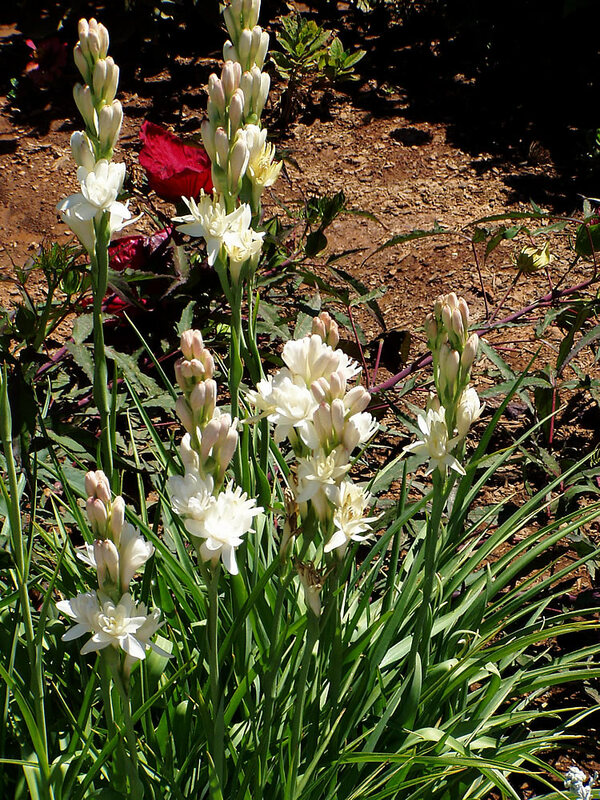 Soil: Polianthes tuberosa grows in fertile and well drained moist soil. Amend the soil at the planting site with a 10cm (4 inch) thick layer of compost to increase the nutrient content and drainage of the soil. Plant the bulbs 8 to 10cm (3-4 inch) deep and 15 to 20cm (6-8 inch) apart and water in well. The flowers will appear about 90-120 days after planting, usually late summer or early autumn. Irrigation: Water generously and regular as the Polianthes tuberosa is establishing itself. It requires frequent deep watering from the appearance of the first growth throughout the growing season. Do not overwater, as Polianthes tuberosa rots easily. Polianthes tuberosa bulbs should receive water on a weekly basis. Cease watering as the plant turns yellow in autumn when the bulbs go dormant. Fertilising: Polianthes tuberosa flourish with generous feeding during the active growth phase. Add complete plant food once growth first appears and repeat fertilizing every 4-6 weeks. Adding a thin layer of organic mulch over the surface of the soil helps prevent weeds and provides nutrients for the Polianthes tuberosa bulb. Dormancy period: Bulbs can be left in their pots or dug up and stored, in a dry place and over-wintered. 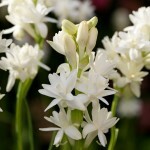 Also, within its hardiness zone, Polianthes tuberosa bulbs can be left in ground over winter. The parent bulb will form daughter bulbs and once these are thumb size, they can be grown next season. After the flowers are harvested, the leaves are allowed to die down, and the pots are put in a dark place until the Spring Equinox. To care for Polianthes tuberosa bulbs in the winter, dig them up after foliage dries out. Allow to air-dry in the sun for about a week or two and store in a paper bag or box with peat moss in a cool location. They like storage temperatures ranging between 21 and 24°C (70-75°F) – but at least keep them in a place that is completely dry and the temperature is above freezing. Propagation: Clumps can be lifted in late winter or early spring for propagation proposes. Polianthes tuberosa reproduce fast and with time clumps will have several mature bulbs capable of blooming. Divide the tubers in early spring. Pull the bulb-like new tubers from the main tuber, separating each plant into several new ones. Plant the tubers immediately after dividing. Same operation is applied for both plants left in place over the winter and for bulbs dried and stored indoors during the winter. Cutting flowers: Removal of the flowers for house display will not harm the plant. Cut flowers for vases when two or three of the lower blooms are opened fully. Remove spent flowers from the spike to prolong the life of remaining cut blooms. With care, this flower will last up to fourteen days. Use flower food solution. Trim off the very top buds to maintain the flower’s straight length and to avoid the stem bending towards the light. Flowers with large stems last longer than those with smaller stems. Usually marketed as entire stems but individual flowers are sometimes utilized. Problems: No particular pests or diseases. Protect Polianthes tuberosa from snails and slugs. Polianthes tuberosa bulbs are prone to rotting, so do not let them become waterlogged. Also, dry the roots thoroughly before storing. Uses: Polianthes tuberosa is used as cutflower, feature plant or mixed border. Place the plants near patios, walks, decks or other living space so that the fragrant flowers may be enjoyed to the fullest. In gardens these flowers will attract butterflies. Known for their pungent fragrance, these flowers are popular at weddings and in cut flower arrangements. 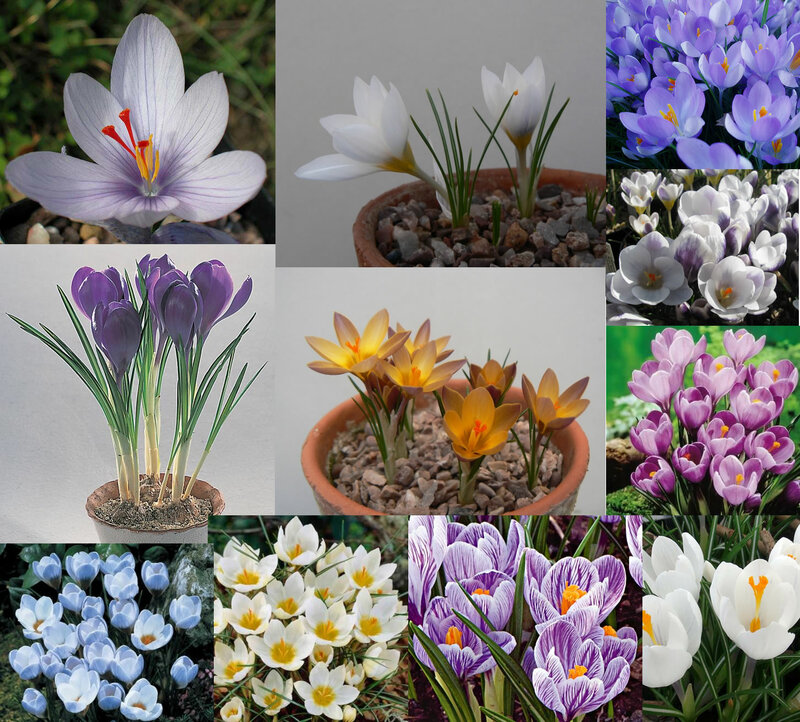 Distibution and habitat: Crocus species are native to woodland, scrub and meadows from sea level to alpine tundra in central and southern Europe, North Africa and the Middle East, on the islands of the Aegean, and across Central Asia to western China. 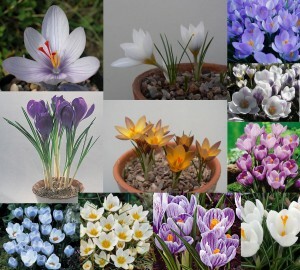 Description: Crocus species are winter flowering plants which are grown from small corms. Their slender, grooved leaves are dark green striped with white and their cup-shaped flowers may be purple, mauve, white, bronze, yellow or striped with two colours. The maximum height of these plants is about 10-12cm (4-5 inch). Outdoors they produce roots and little or no growth during the cold winter months and have a brief flowering period at the beginning of the spring. After this, most of leaves grow and die down within a couple of months. Individual flowers will last from two to five days, but plants can last from seven to 12 days. The lasting quality will vary greatly by cultivar as well as the temperature and light levels in which the plants are displayed. Houseplant care: Dutch hybrids which have flowers two or three times the size of the true species, make the most satisfactory house plants. Use only one flower colour for each container, since different coloured hybrids may bloom at different times. Planting: Crocuses to be displayed indoors should be encouraged to make root growth before top growth gets well under way and they will do this only if kept cool. Plant several corms together just bellow the surface of a soil based potting mixture. Containers may be shallow pots, half-pots or bowls. Crocuses planted in bowls without drainage holes need to be watered with great care. Plant-up bowls or pots outdoor and bury them beneath a thick covering of peat moss. Ideally they should not be brought inside until the flower buds begin to show some colour. Indoor plants then can be enjoyed while they are in bloom. Alternatively, plant them early in the autumn, water only enough to keep the potting mixture just moist and place the plants in as cool and dark position as possible if the outdoor burial is not feasible. An ideal procedure for apartment dweller is to cover the prepared pots or bowls with a black plastic bag and put them out on a basement, unheated garage balcony or refrigerator in cool temperature (about 4°C – 40°F). Inspect them from time to time to make sure that no further watering is required. It will not be necessary unless the potting mixture dries out completely. Crocuses need a cold treatment for 12 weeks to bloom. In mid-winter the potted plants may be brought into gentle warmth (maximum 15°C – 59°F). For their short stay in home, keep them cool, out of direct sunshine, but in bright light. When flowering has ended, they can be put outside again and can either be left to wither naturally in the pots – after which the corms should be dried for autumn replanting in the open ground or else they can be planted in ground directly. They will not flower again indoors. Light: Bright, diffused light is best for indoors. Full sun or filtered sunlight is best if Crocuses are displayed outside. Temperature: Cool areas 13 to 18°C (55-65°F) are best for displaying Crocuses. Keep humidity at moderate levels for Crocuses. Water: Keep the potting mixture evenly moist. Severe drying will cause leaf yellowing and drop and also will delay flower development. Feeding: Apply a bloom fertilizer in moderation at every watering. An African violet food is a good choice. Propagation: Crocus are grown from corms, a bulb-like stem. It will produce offsets, but they take a few years to mature. The mother corm will produce several baby corms, then usually die in the same year. The new corms can be dug up and separated to be replanted. Make sure to mark and keep colors separate. Crocus tolerates overcrowding, but dividing in autumn the corms is a good way to introduce the flower to other areas of the garden or for indoor display. Plant the new Crocus corms as soon as possible after collecting them. For storage, place them in a 4 to 10°C (40-50°F) darkened area before planting. Also Crocus can be propagated by seed sown in autumn. It can take up to three years before seed sown plants produce flowers. Crocus blooms attract thrips and aphids. Treatment: Control them with a solution of insecticidal soap. Crocus ‘Pickwick’ has silvery lavender petals with dark purple stripes. Crocus ‘Remembrance’ giant blooms are shiny, deep purple. Crocus ‘Flower Record’ giant Crocus is available in several colors. Availability: Seed, corns are available at nurseries and garden centres. Corns are preferable as seed takes years to flower. Also pots with flowers are available form late winter though spring. Toxicity: The corms of the Crocus species can be toxic to some people and other animals if eaten, but these flowering plants are listed as an allergy-safe pollen-producing plant. Uses: Crocus hybrids are the perfect choice for spring displays. They stand well alone or grouped with other spring-flowering and foliage plants. They also make an ideal choice for rock gardens. Distribution and habitat: The genus Caladium indigenous to South America. They grow in open areas of the forest and on the banks of rivers and go dormant during the dry season. The wild plants grow to 40–90cm (15–35 inch) tall, with leaves mostly 15–45cm (6-18 inch) long and broad and have subtle white flowers. Description: Caladium species are tuberous-rooted plants with heart-shaped leaves or arrow-shaped leaves on long stalks rising directly from the tubers. 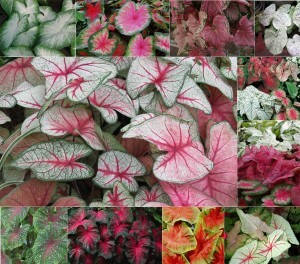 The Caladium species in cultivation are hybrids of mixed origin that are usually grouped under the name Caladium X hortulanum; many of them are known by varietal names. The size of the paper-thin leaves varies considerably, but an average leaf in 30-38cm (12-15 inch) long on a similar length stalk. Colour can be practically all white with just the fainest tinge of green along the veins; or the leaves can be spotted, veined, blotched or marbled red, pink or white on green. Some kinds have much smaller than average, predominantly green foliage and these are far the easier to grow than the others. Although all varieties have flowers, they are grown for their spectacular foliage, rather than for flowers. 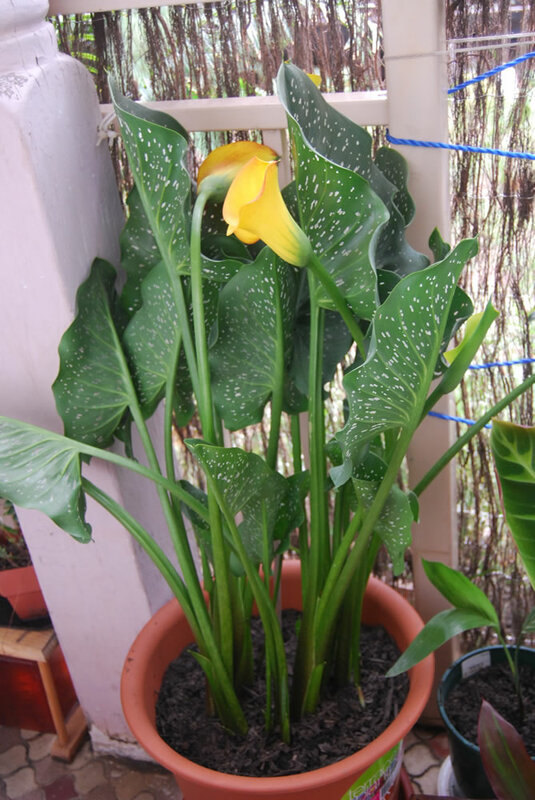 Houseplant care: All these plants need usually constant high humidity to maintain healthy foliage; since this is diffcult to achieve indoors, Caladium X hortulanum are often grown as temporary plants – very ornamental for short period when they are in leaf, but discarded when pass their prime. It is not necessary to discard them, however. After the leaves have died down, dormant tubers can be kept in their pots and given the right condition, will produce new growth in the following year. 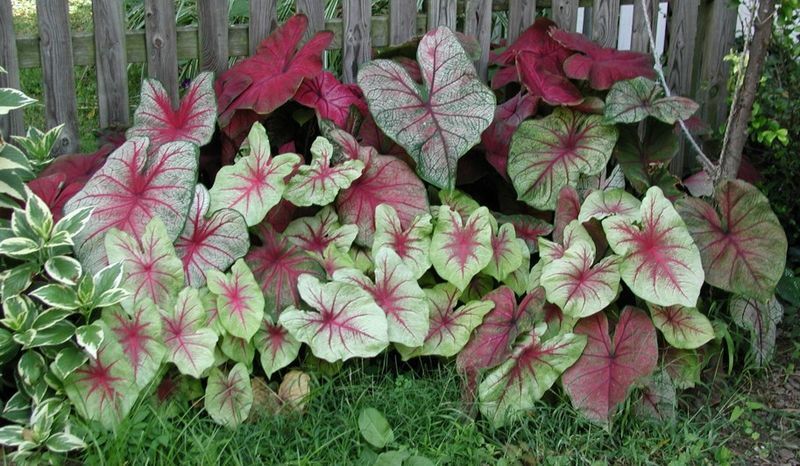 Light: Caladium X hortulanum require bright light, but must not be exposed to direct sunlight. Temperature: A temperature of at least 18-24°C (64-75°F) with a correspondingly high degree of humidity is essential for plants in leaf; pots should be kept on trays with moist pebbles and foliage mist-sprayed daily. Caladium X hortulanum must never be exposed to droughts or the leaves will crumple up within an hour or two. Store dormant tubers in the dark at a temperature of about 15°C (59°F). Water: Caladium X hortulanum are plants of tropical jungles. During the active growth period therefore, water them moderately, enough to make the entire potting mixture moist. But, as leaves begin to dry out and die down, reduce the frequency of watering. The tubers require a rest period of at least five months, from early autumn through early spring and during those months they should be watered only sparingly (once a month, say). Fertilising: Apply half-strength standard fertiliser every two weeks in the active growth period only. Potting and repotting: Use a peat based potting mixture and put fragments of clay pot or other drainage material in the bottom of the pot to improve drainage. Dormant tubers should be potted in fresh potting mixture in spring. Pots about 8cm (3 inch) in size are adequate for small tubers and for these with small leaves; 13cm (5 inch) pots are best for larger plants. Tubers should be buried at about their own depth from the surface – plant a 2cm (0.8 inch) thick tuber about 2cm (0.8 inch) below the surface. Maintain a temperature of at lest 21°C (70°F) to start growth. Garden Culture: Caladium X hortulanum tubers need to be dug and stored each year before frost. Even in locations where Caladium X hortulanum may be left in the ground, the tubers seem to perform better when dug and protected from wet winter soils. Water should be gradually withheld as the leaves naturally start to yellow in fall, then the tubers dug, cleaned of soil and left to dry in semishade for about 10 days. The tubers should be dusted with an insecticide-fungicide prior to being stored in dry peat moss or vermiculite at temperatures between 10-16°C (50-60°F). This helps prevent rot. Caladium X hortulanum require a warm, moist soil. A minimum soil temperature of 21°C (70oF) is preferred. If planted too early in the spring, cool soil temperatures will cause tubers to rot before they sprout. In the warm, humid climates of zones 8 and 9, plant Caladium X hortulanum tubers directly into the ground in spring. In most other areas, to start Caladium X hortulanum indoors for outdoor planting, pot them up about 4-6 weeks before transplanting them in garden. Wait until the soil warms to plant outdoors. Peat pots will make transplanting easier on the plants. Also, these species can be grown in containers in shaded positions outdoors. The great advantage of pot-grown Caladium X hortulanum is that they can be moved as needed to keep them warm. When nights become chilly in fall, bring them indoors and keep them in a sunny window, until the leaves begin to wither. Position: Caladium X hortulanum grow best in the partial shade of open, high-branched trees. They will perform reasonably well in full shade, but the color may not be as outstanding. Generally they will need protection for the direct sun light. When grown around the bases of trees, make a 13cm (5 inch) deep bed of rich soil so the tuberous roots will have adequate space and a fair chance at moisture. Soil: Grow Caladium X hortulanum in acidic soil that is moist and well drained. For best growth, a layer of pine bark mulch or compost should be incorporated into the soil to improve soil aeration, drainage and organic matter content. Plant tubers 5cm (2 inch) deep and 20cm (8 inch) apart for small tubers and 30cm (12 inch) apart for large tubers. 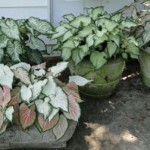 Water: Caladiums are not drought tolerant and should be watered on a regular basis, but do not overwater them. Add mulch to conserve moisture and keep the soil cool during the hot summer. Fertiliser: Feed outdoor planted Caladium X hortulanum once a month during the active growth period. Do not allow fertilizer to contact the leaves. Water thoroughly after fertilization to prevent fertilizer burn. Propagation: Detach small tubers from the parent at the time of restarting into growth. If it is potted up and cultivated as recommended above, each tuber will produce a new plant. The new tubers reach their maturity in one to two years. Problems: Any problem (such as premature withering of the leaves) is likely to be caused by failure to provide suitable conditions: constant warmth and a high humidity are essentials. Availability: Caladium X hortulanum can be bought as potted plants or as dormant tubers. Toxicity: The Caladium X hortulanum plant may be poisonous so keep it away from pets and children. Contact with Caladium X hortulanum sap may irritate sensitive skin. 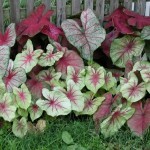 Uses: Caladium X hortulanum grow rapidly and are beautiful indoors as well as in a garden. Indoors, Caladium X hortulanum, because their need of high humidity, are best grown among other plants needing similar conditions. It is excellent for providing foliage color spring, summer, and fall. 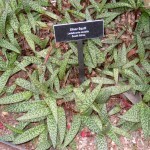 This plant is primarily grown for its attractive foliage and is suitable for borders, containers and as a specimen. Grouped together, they can look like they are in bloom. 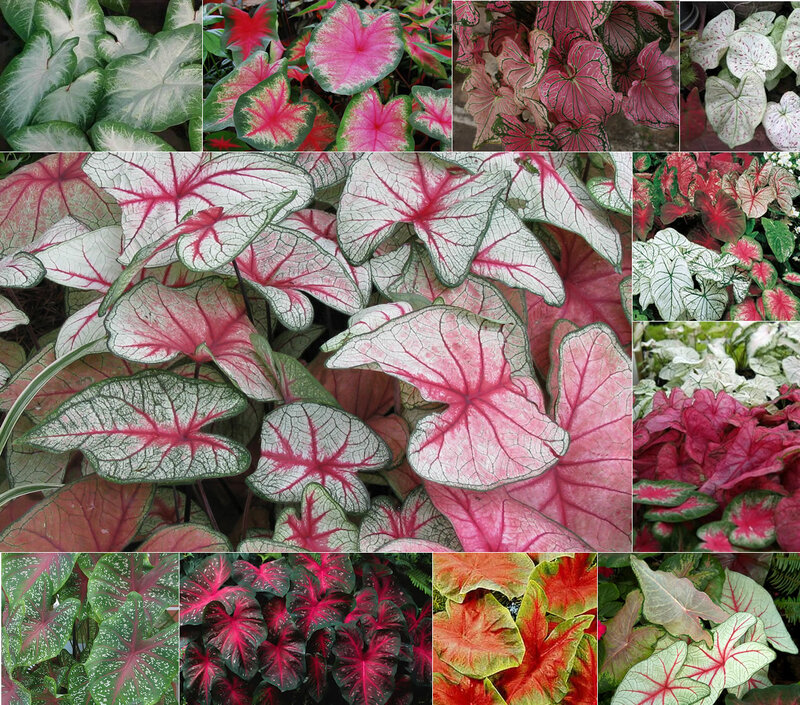 Caladiums grow equally well in containers and pair nicely with ferns and other soft textured plants like Astilbe species, with spiky leaved plants such as ornamental grasses and shade tolerant Iris and with coordinating colored blooms of Fuchsia and Impatiens. 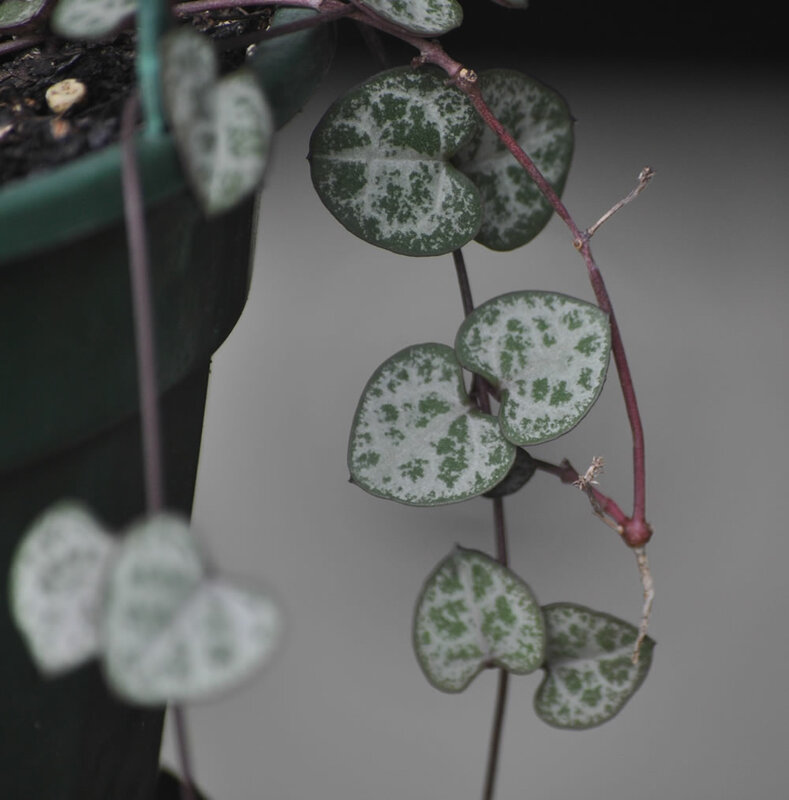 Distribution and habitat: Ceropegia woodii is native to South Africa, Swaziland, and Zimbabwe. It is an evergreen succulent trailing vine that grows to 10 centimetres (4 inch) in height and spreads to reach up to 2–4 metres (6.5–13 feet) in length. It lives in forested areas with its small tubers embedded on rocky ledges or in banks of soil. In its natural environment, root development is stimulated when the nodes touch the soil. The plant is thus easily grown from cuttings. Description: Ceropegia woodii are trailing stemmed plants, pendent arising from a tuberous rootstock. 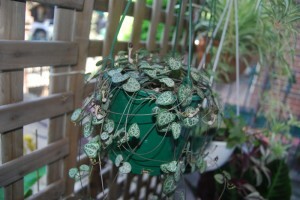 Only Ceropegia woodii from Ceropegia species is popular as indoor plant, which is a highly effective trailer for use in a small hanging basket. The tuberous base of Ceropegia woodii is quite hard, gray, woody and wrinkled and it can eventually measure as much as 5cm (2 inch) across. It usually sit on the surface of the potting mixture and from it emerge several purple, thread-like stems. These stems can grow 1m (3 feet) long, but do not generally exceed 45cm (18 inch). Along stems, at about 8cm (3 inch) intervals, grow opposite pairs of fleshy, heart-shaped leaves on short leaf stalks. The delicate little leaves are dark green and marbled with silvery white on the upper surface and purple on the underside. From the leaf axils appear 2cm (0.7 inch) long flowers vertically oriented, each of which is a narrow, fresh-coloured tube housed in a small, round, purple base. The flowering season for Ceropegia woodii is usually late summer to early autumn. The flowers last up to six weeks. Here and there along the stems of Ceropegia woodii, tuberous growths are produced and these are used for propagation. The flexible stems branch occasionally, usually at one of these small tubers. The stem can grow free hanging down over the edge of the pot or basket, but alternatively the long stems can be trained upward on miniature trellises. Light: Ceropegia woodii needs at least three or four hours of direct sunlight every day. Too little light impairs leaf colouration and extends the gaps between the pair of leaves. Partial shading is useful when the plant is grown outdoors. Temperature: Normal room temperatures are suitable for Ceropegia woodii throughout the year. It can be grown outdoors only in subtropical and tropical areas, with a minimum temperature of 15°C (59°F). Water: In the active growth period water sparingly, just enough to make the potting mixture barely moist, allowing the top two-thirds of the potting mixture to dry out between waterings. During winter, water very sparingly , just enough water to prevent the potting mixture from drying out completely. Fertilising: During the active growth period give standard liquid fertiliser once a month, but only to fully mature healthy plants. Potting and repotting: Use an equal-parts combination of soil-based potting mixture and coarse sand. Be sure to have a shallow layer of clay pot fragments in the bottom of pots for quick drainage. Move small plants into pots one size larger in spring; older plants will continue to thrive in 8cm (3inch) or 10cm (4 inch) pots or half pots for several years. 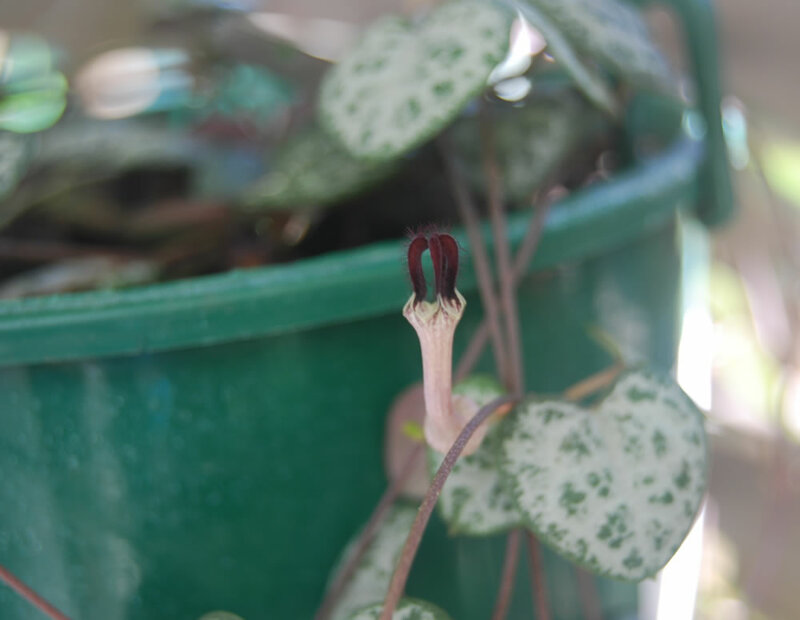 When planting a few Ceropegia woodii in a single hanging basket, place the tubers about 4-5cm (1.5-2 inch) apart to get them the most effective display. Propagation: At any time during the active growth period, Ceropegia woodii can be propagated by means of the tuberous growths produced along the stems. After removing a stem tuber, set it in a small pot of recommended potting mixture over which a centimetre (0.4 inch) or so of coarse sand has been sprinkled. Placing the tuber just on top of sand to prevent rot. Alternatively, stem cuttings 15cm (6 inch) long may be used instead; they should be planted in same mixture, but some extra sand should be trickled down the hole made for the cutting as insurance against rotting. The potted tuber (or cutting) should then be stood in medium light and watered very sparingly – allow about two-thirds of the potting mixture to dray out between applications – until the new feeding roots are established. New top growth will appear before these roots have been made; this may take around eight weeks, after which growth will be quite quick. When the young plant is established and growing well, move it gradually into a position where it will get direct sunlight. From this stage the plant can be treated as a mature Ceropegia woodii. Problems: Ceropegia woodii is generally trouble-free. Yellowing leaves may indicate rotting of the tuber, due either to over-watering or to winter temperatures that are too low. Treatment: Remove soil from around the tuber and allow it to dry out if the damage is not too severe. Unfortunately, if the tuber has rotten the condition cannot be reversed and the plant will have to be discarded. Ceropegia woodii has few pests, but mealybugs can be a problem. Treatment: Treat any infestation immediately with an appropriate pesticide. Spray all top growth with pesticide. During the next month examine plants weekly for traces of re-infestation. Uses: Ceropegia woodii is often grown in hanging baskets so the long trailing branches can hang down with their leaves spaced out like a row of long beads. 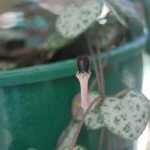 Ceropegia woodii may be used as a focal plant to attract interest, because the flowers have a unique shape. It is ideal for hanging baskets that could be hung from tree branches or above a patio. Alternatively, consider potting the plant and training it to grow along a small, circular trellis to produce a decorative hoop of leaves. It will be attractive when hung against a wall like a curtain or from the top of a pergola. It is best used as a container plant under roofed patios, on verandas, balconies of flats or any other place in and around the house where space is restricted.